All photographs by Paul M. Clayton unless otherwise noted. Click on a picture to see it larger. This is the current page, posts from 9/1/2018 through today. The lower Yadkin Valley is a short drive from home and offers a lot to explore. Over the past 50 years , I have canoed the river and fished it, sat along its banks, swam in its waters and drank beer on its sandbars, hiked and camped nearby. It has changed in many ways, mostly for the better. 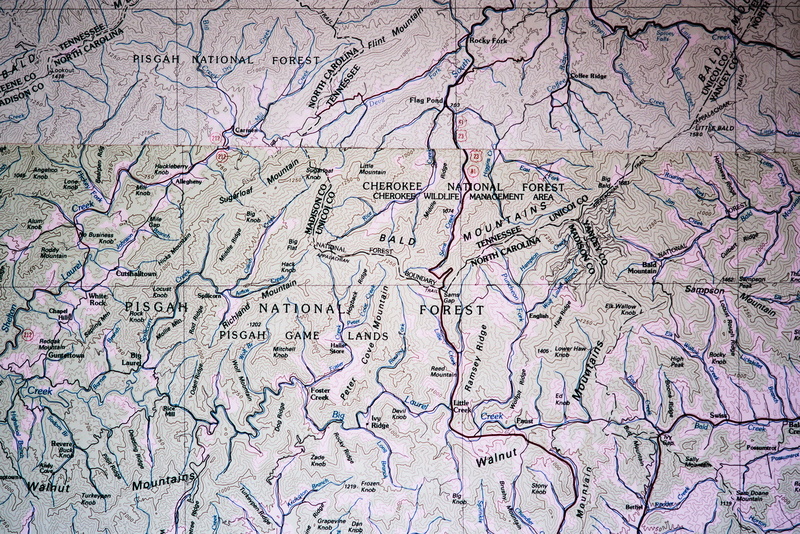 The Yadkin supports a growing population of smallmouth bass and is developing a reputation as a prime fishing river. Quite a change from when I was younger and the river ran thick with silt, agricultural runoff and toxic residues from the Elkin and North Wilkesboro plants. For this we should thank the environmentalists and the EPA. It is also an unintended side effect of globalization. The toxin-spewing textile and furniture plants are all shut down now. 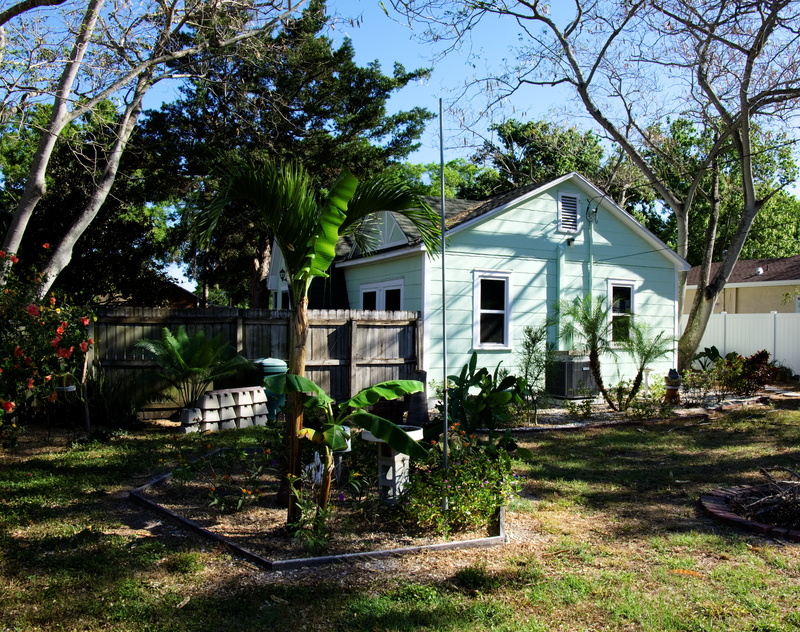 The old plants didn't survive and the few that exist now are newer and much cleaner. The surrounding lands are hilly with farms interspersed with woodlands. There are several small communities in the valley that once catered to the needs of local agriculture but now are redeveloping as exurbs of Winston-Salem. There is one town that is industrializing, and two that are in post-industrial decline. 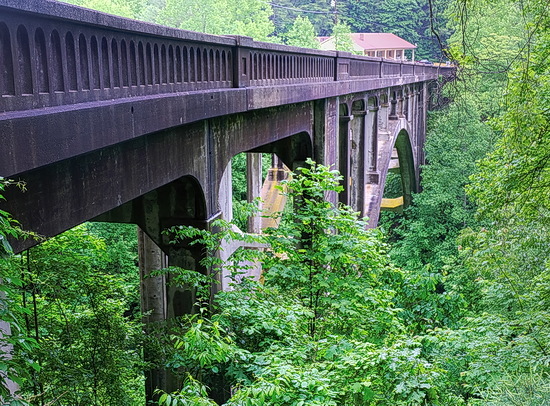 The Yadkin Valley Railroad runs along the river from Donnaha to North Wilkesboro. 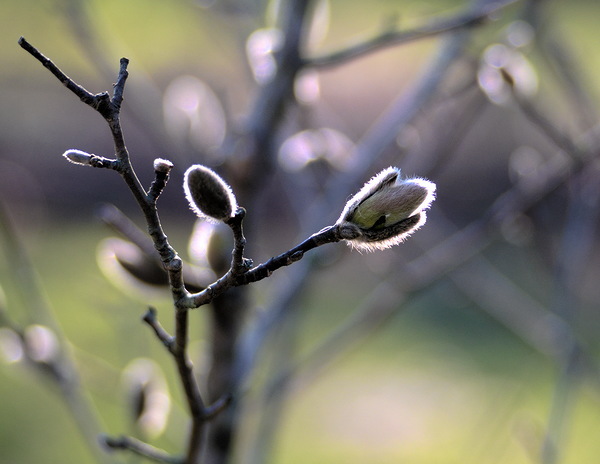 Early spring of 2019 I spent a day driving the backroads between Winston-Salem and North Wilkesboro. 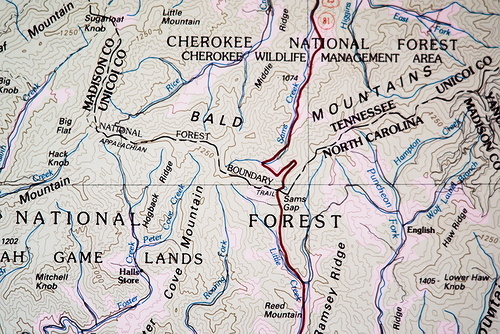 I picked up the river at Donnaha and drove west, braiding the river and railroad as far as North Wilkesboro. 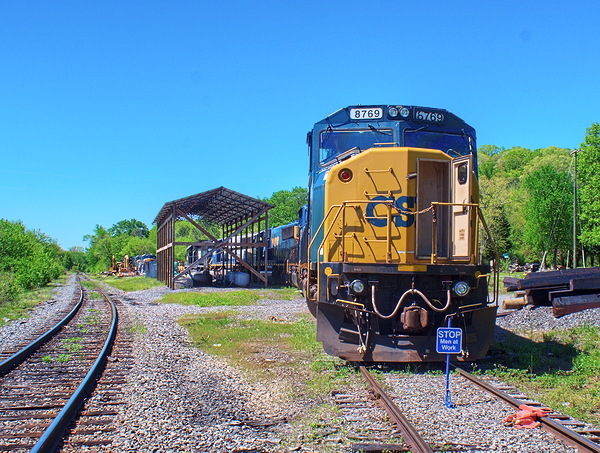 Donnaha is the site of Yadkin Valley Railroad's open-air maintenance facility, and that day I found two YVRR engines and two from CSX. A contract track maintenance crew was working to replace ties just east of Donnaha. Highway 67 crosses the Yadkin River at Donnaha on a bridge built in 1950 and probably in its last years now. A 2015 inspection described the bridge structural condition as "[b]asically intolerable requiring high priority of replacement". The builder's plate states "Forsyth County, State Project 7424, Federal Aid, 1950". The road was built in 1930 at the behest of Thurmond Chatham, President of Chatham Manufacturing Company, as far as I can tell to connect his factory in Elkin to his factory in Winston-Salem. Upstream, the river is bridged at Siloam and Rockford. The span at Siloam was long a one-lane overhead truss type. On a foggy night in 1975, a driver crashed into one of the overhead supports, collapsing the bridge into the river. Due to the low visibility, several more cars plummeted over the brink, resulting in the loss of four lives and injuries to sixteen more. The bridge was replaced with a modern concrete span. Upstream at Rockford there was a low-water bridge that submerged when the river ran high. Canoers portaged around the bridge or lined their boats down through the culverts. Like Siloam, this bridge has been replaced with a more modern span. Highway 601 crosses the river at Crutchfield, which once boasted a train station. Now there is a small parking area in the shadow of the bridge (another new, modern concrete one) for canoers and fishermen. There is a deep hole in the riverbottom here that has long been dredged for sand. 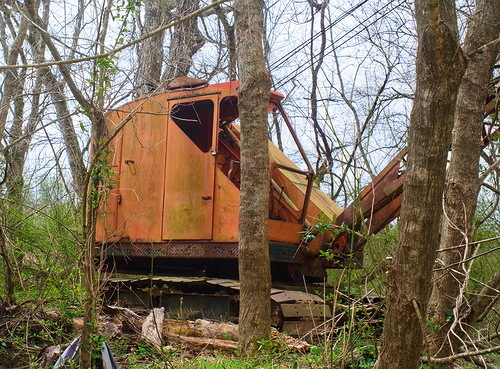 Near the parking area is an old Bantam dragline, showing no signs of recent use and gradually being overtaken by vegetation. The Schield Bantam Company built these light cranes starting in 1942. Eventually the company was acquired by Koehring, which afterward folded into Northwest Engineering, which is now known as Terex. The Terex Corporation is proud of their heritage and includes a page at their website devoted to Bantam cranes. Crutchfield is little more than a crossroads, but a few miles west is Elkin, a real town with a population of about 4,000. Elkin is the site of the abandoned and partially demolished Chatham Mill, which looms above the town like a medieval castle. Textiles, along with tobacco and furniture, made up the industrial base of western North Carolina from the late 1800s into the late 1900s. Many of the mills were dark, dangerous places ruled by brutal managers, and I for one am glad they are gone. Doubtless some of the Asian plants are just as bad. Anecdotal evidence suggests the Chathams were more benevolent than the Cannons and Stevens's in the Piedmont. As bad as the mills were, they offered a better life than could be had in the high country of Appalachia, and the descendents of Scotch-Irish immigrants poured by the hundreds of thousands down the roads from the uplands to take jobs in the mills of the Carolinas. 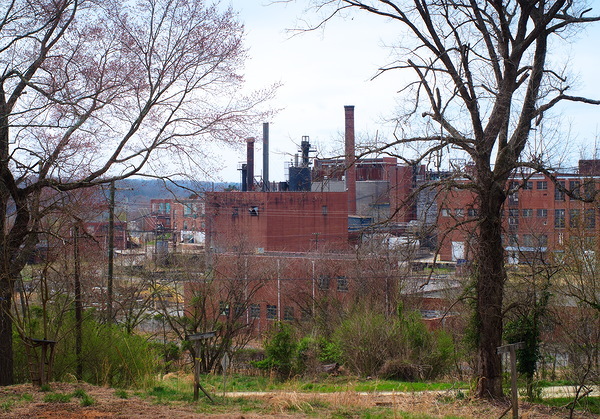 Chatham Mill in Elkin employed over 2,000 at its peak. Shortly after the Civil War, Alexander Chatham and his partner Thomas Lenoir Gwyn bought a wool processing operation in Elkin (for more on the Lenoirs, see my post on the upper Yadkin Valley, dated 5/19/18). In 1893, a new mill was built, and was steadily expanded over the years. Thurmond Chatham, a grandson of Alexander, ran the company from 1929 through 1957, enhancing his power and fortune through marriage to the daughter of John Wesley Hanes and a stint in the U.S. House of Representatives. The Chatham family maintained a controlling interest in the company stock until 1988, when a Danish company wrested away control and promptly went bankrupt in a cloud of fraud and scandal. Things went downhill from there. CMI Industries bought the plant and changed its name to True Textiles Inc. West Point Stevens bought part of the plant from them and operated for a while before giving up the ghost. True Textiles may still be running a stub of the original operation, employing 60 to 100 people in one of the newer wings of the plant, but little activity is in evidence. Regardless of whether the Chatham family had been able to retain control of the plant, textile manufacturing in North Carolina was on its way out. Burlington Mills went bankrupt in 2001. Cannon Mills and Cone Mills followed in 2003. The mergers and subsequent bankruptcies of J.P. Stevens and its descendents are so complex as to require a doctorate in Business Administration to follow. Dozens of other concerns closed between the 1970s and 2010s. Hanes survived by largely getting out of the manufacturing end of the business and becoming a branding and marketing operation. Unifi is hanging on - not prospering - in Yadkinville by virtue of a modern plant and innovative new products. Elkin still has some industry. There is a big Weyerhaueser plant on the west side of town, and a break bulk distribution facility for propane dealer G&B Oil Company, along with a couple other operations, all served by rail. Poultry farming is big business in Yadkin and Wilkes Counties, and there are three large feed mills along the river, all served by rail. 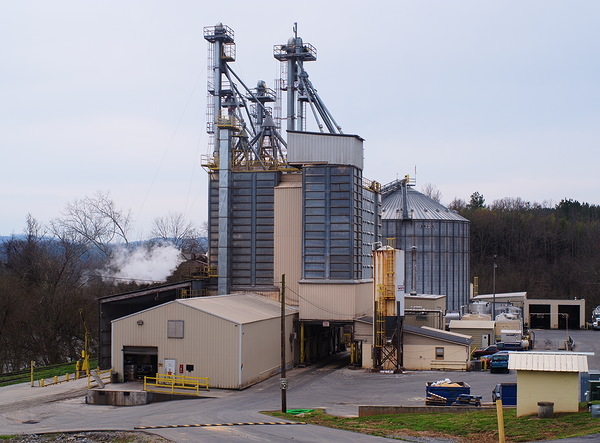 In Burch is the Perdue mill, then in Ronda, the Wayne Farms mill, and finally in Roaring River, the enormous by North Carolina standards Tyson mill. Each of the mills buys grain, grinds it and mixes in various nutrients ranging from limestone to flax seed that chickens need to thrive. Producers ranging from family operations to agribusinesses buy the feed and raise the chickens, which are then sold back to the big marketers Perdue and Tyson. Wayne Farms is a division of Continental Grain which supplies much of the grain. The Perdue Mill in Burch is an outpost of the huge Salisbury MD Perdue Farms. The Perdue family started the business in 1920 and scion Frank Perdue ran it for many years. Some may remember his starring role in commercials for the company where he averred that "it takes a tough man to raise a tender chicken". Close to the Burch Mill is a boat ramp for the use of canoers and fishermen on the river. I recently met two young fishermen launching their canoe at Burch, to paddle upstream to a nearby shoal and then wade the waters casting for smallmouth bass. They told me they usually went to the New to fish but the angling on the Yadkin has gotten good enough in recent years that they frequently chose it over making the long drive up to Watauga County. The Mitchell River joins the Yadkin here and is known for trout fishing in its upper reaches. Wayne Farms runs a neat, trim mill and hatchery at Ronda. Tyson and Perdue produce chicken feed to support their primary business of selling processed chicken. Everyone has heard of Tyson and Perdue, because they have seen their names on television or in the grocery store. Nobody has heard of Wayne Farms. As a subsidiary of giant agribusiness Continental Grain, Wayne Farms produces feed as an outlet for Continental's grain sales. All the mills sit in the middle of the supply chain, but their owners are at opposite ends. The Tyson facility in Roaring River is the largest of the Yadkin Valley mills. I've heard stories of the Yadkin Valley delivering 80 car trains to Tyson, enough traffic to explain why this far-flung branch line has stayed in business. Wilkes County used to be under the purview of Holly Farms, which ran a big processing plant in Wilkesboro. When Tyson in 1988 decided to move toward national distribution, they bid $1 billion for Holly Farms. In the end, they had to pay an additional $400 million dollars, but by mid-1989 they completed the deal. Poultry production is the state's leading agricultural industry and Wilkes County is the third-biggest producer, behind Duplin and Union. Wilkes County farmers raise about 55 million chickens a year. 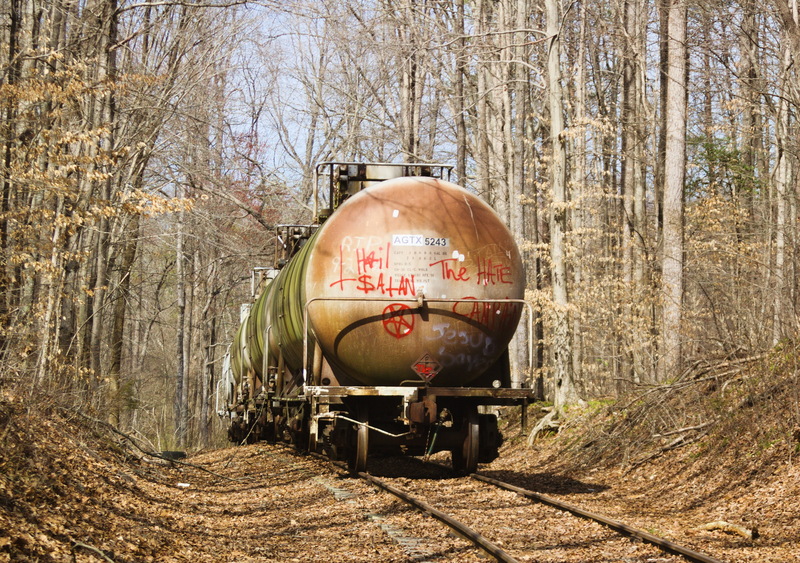 Roaring River marks the last traffic source for the Yadkin Valley Railroad. West of town, the track is in decrepit shape, overgrown with honeysuckle and pine saplings. Even worse, in places the roadbed is washing out, leaving the tracks suspended in air. The worst spot I saw was along River Road, not far east of the Lowe's warehouse on the edge of North Wilkesboro. Here, the railroad and road cross a small creek, which flows down through a cove into the river bottom. The road and railroad cross the mouth of the cove on a low fill, with an ancient rock box culvert to carry the creek under them. 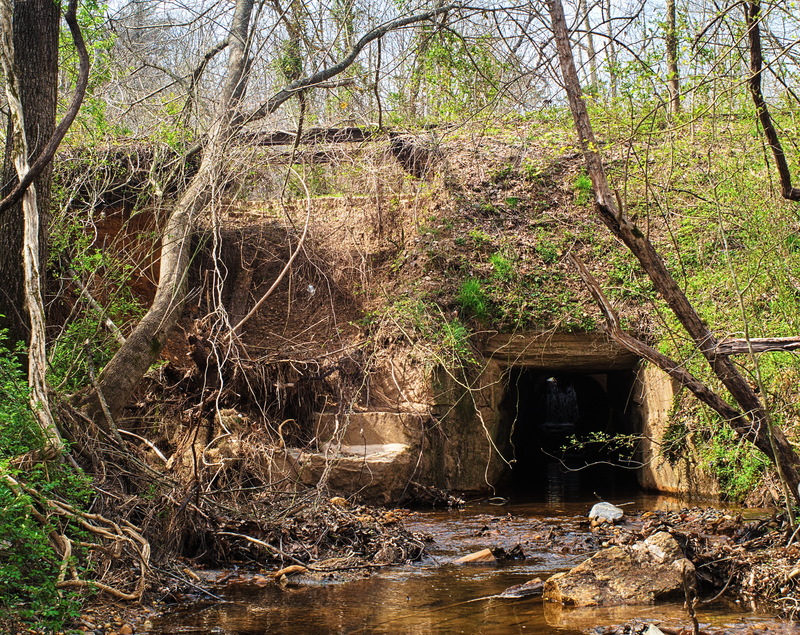 It appears that, during the heavy rains and flooding of last winter, the culvert got choked and water ran over the road and railroad, eventually washing out the fill under the tracks and scouring a deep hole. I found a place to park a couple of hundred yards from the washout and scrambled down the bank through brush and briars to a point below the washout where I could get a picture of the culvert and rails. But try as I might I could not find a good angle with my Takumar 55 so trudged back to the car and got the 35. It was worth it to get a clear shot of the ancient rockwork, quite possibly a hundred years old (the line to North Wilkesboro was completed in 1890). The one exception to the general decrepitude of the out of service stretch of railroad can be found just inside the North Wilkesboro city limit. Lowe's, the big-box building supply company, maintains a huge warehouse and distribution center that was once serviced by rail. The grounds crew keeps the track in front of their facility neatly mowed and groomed, as if they expect a trainload of lumber to show up any day. The modern-day Lowe's corporation is headquartered in Mooresville but the first store, opened in 1921, was Lowe's North Wilkesboro Hardware. To this day the company has a large presence in Wilkes County, employing over 2,400 people there. Eventually the Lowe family sold their interests in the home improvement company and started a grocery store chain called Lowe's Foods. In many North Carolina towns you will find the two stores in the same shopping center, even side by side, but there is no corporate relationship. North Wilkesboro is end of the line for the railroad. The town used to have a fair amount of industry, but, like Elkin, that is all in the past. A small hospital and several doctor's offices serve the routine medical needs of the local people and the ones coming down from the mountains to the northwest. More severe cases go to the big city hospitals in the Triad. The town has reversed a decades-long decline in population in recent years, as it slowly transitions to being a bedroom suburb of Winston-Salem, an easy hour's drive to the east on a modern, fast four-lane highway. 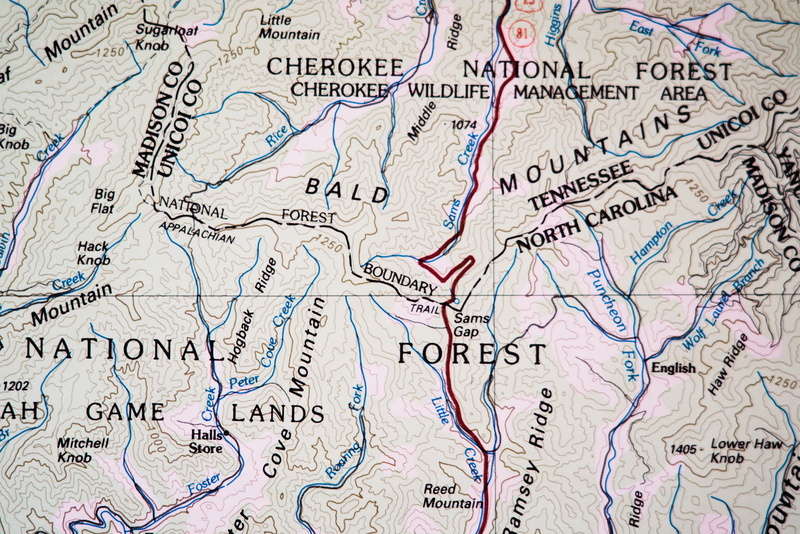 The twin towns of Wilkesboro and North Wilkesboro mark the dividing line between the upper and lower parts of the Yadkin Valley. Above, the land is intensely rural and under-developed, below it transitions to large-scale agricultural with a sprinkling of industry and the beginnings of exurban development. Above, the river is narrow, shallow and fast, below it becomes wider and slower. At East Bend, it pours out into the Piedmont and becomes a broad, powerful, muddy main stem that provides drainage for an enormous area of southeast North Carolina, before flowing into the sea as the Pee Dee at Winyah Bay, SC. Railroadfan.com's monthly CSX roster update for February 2019 list SD60Ms 8769, 8772, 8777, 8781, 8781 and 8783 as sold to Yadkin Valley Railroad. So what did I find at the Donnaha engine servicing facility yesterday but these six engines (plus a couple of home road units)? The engines were built for Conrail in 1993 and ended up in CSX ownership sometime later. From the looks of the roster information, CSX is purging itself of its SD50 and SD60 fleets, selling off 144 SD50s and 57 SD60s. The SD60 model was introduced in 1984 and produced through 1995. It was the first model to incorporate the 710 prime mover, succesor to the the long-lived 645. It was considered a good, if not spectacular, performer, and solid enough so that most are being rebuilt to get another decade or two of life. I can't imagine Yadkin Valley having much use for them on its twisty, light rail, so I'm guessing they are going to clean them up and resell them, or perhaps send them to sister roads. Fujifilm X-T20, Vivitar 19mm f/3.8. Galax is a flowering plant associated with the Appalachian mountains. 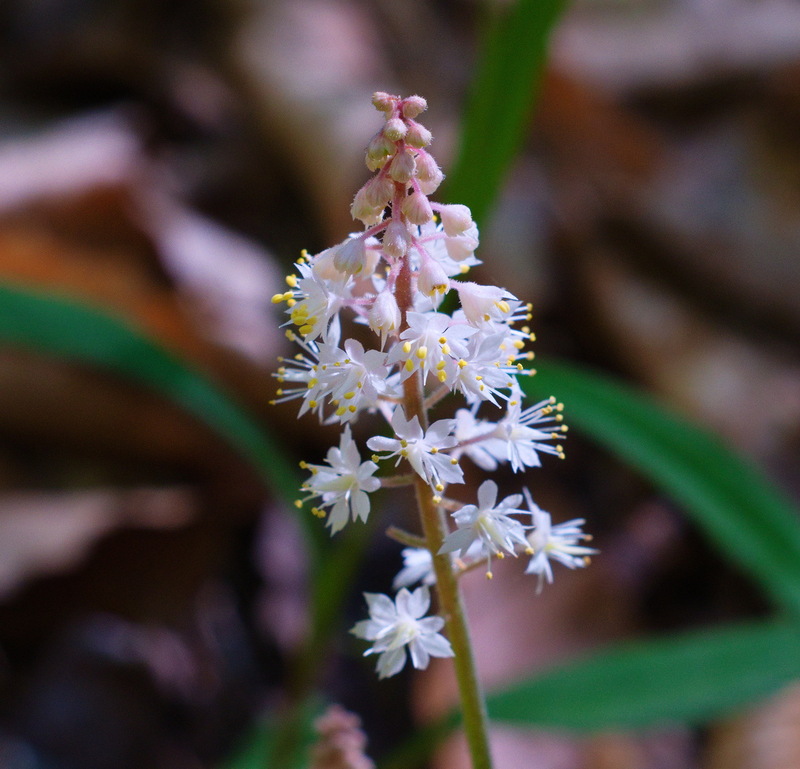 I found a patch of it along a creek while hiking in Surry County. Fujifilm X-T20, SMC Takumar 55mm f/2 on 12mm extension tube. The Wade Harris Bridge was built in 1930 to carry U.S. 421 over the South Prong of Lewis Fork in far western Wilkes County, and, according to the NC Department of Transportation, was at the time it was built "the longest concrete arch bridge east of the Mississippi River". The builder's plate indicates that the structure was originally named the Ravine Bridge, but in 1931 it was renamed for Wade Hampton Harris, editor of the "Charlotte Observer". Bringing the road down off the Blue Ridge Escarpment was a considerable engineering feat for the day, but the end result was a narrow, twisty, dangerous stretch of blacktop. The road was especially treacherous in snowy and icy conditions, which were common enough in winter. In particular, navigating tractor-trailer rigs down from Deep Gap was a ticklish affair. A fair proportion of men in Wilkes County drove trucks for a living, and the death toll was high. One of my earliest memories is of my father preaching the funeral for a man in his church who had died in a wreck coming down the mountain. The NCDOT did their best to make the road safer, adding two sand piles upgrade of the bridge for trucks to run into that had lost their brakes, plus a section of road in a dip where trucks could pull over and cool their brakes. But the carnage on U.S. 421 never really declined until the state undertook a massive rebuilding project over the last two decades of the 20th century, straightening the road and bringing it out to four lanes. One result was that the Wade Harris Bridge was bypassed. It still exists, but is closed to public access, serving only an isolated private property at its east end. I remember seeing a particularly horrendous wreck on U.S. 421 back in the early 1980s. By that time the road had been rebuilt on the lower stretch along Lewis Fork, bypassing the infamous "dead man's curve" hairpin on what is now Boone Trail Road. As we headed west, we came to a long line of stopped traffic and waited for half and hour before we finally began to inch up the mountain. The first we saw of the wreck was the trailer bogie off in the woods on the downhill shoulder, then the trailer jack-knifed across the right lane. We were flagged around the trailer, and just above found the tractor smashed into the sheer rock wall at the hard right turn at the lower end of the Wade Harris Bridge. The load of bricks had flattened the cab and scattered all along the road. On up the mountain, we saw tire tracks and ploughed up sand where the driver had desperately tried and failed to get over into the sand piles. With the construction of I-77, essentially complete by 1981, much truck traffic between the midwest and southeast diverted to the new route. Even so, U.S. 421 carries a fair amount of commercial traffic. These days, with the rebuilt road and modern, more controllable rigs, fewer drivers have to cope with the terror of piloting an out-of-control rig down U.S. 421, but I'm sure even now there are plenty of anxious moments. The hairpin curves and narrow Wade Harris Bridge are no longer a threat, but the grades are still steep. The downhill lanes are festooned with warning signs and lights, the brake cool-down lane still gets good use, and the sand pits are still plowed and ready for the next out-of-control rig to make an abrupt but hopefully not fatal stop. Mid-day April 2nd, 2019 we had some light flurries but no accumulation. April snow is not uncommon in Winston-Salem but it is generally light and short-lived. As of April 20th, it's still cool but not cool enough to snow. The forecast for later in the week is much warmer, so I'm guessing that April 2nd will stand as the last snowfall of the winter. Fujifilm X-T20, Vivitar 19mm f/3.8. I never had a wide angle lens for my Spotmatic. The X-T20 kit zoom opens up to 16mm, the equivalent of 24mm full frame, which would be considered moderately wide, but in truth I don't shoot with that lens much. There's nothing wrong with it, but I just prefer the look that I get with old film-era primes. Recently I found a Vivitar 19mm f/3.8 in Nikon AI-S mount on Craigslist for $20. First I verified that I could get a cheap Nikon to Fuji adapter, and then I checked out the reviews at Pentax Forums which were mostly positive. A call to the seller elicited that he was getting rid of his older film-era kit and that the lens was in immaculate condition. I met him at a local store and quickly sized him up as either a professional photographer or serious amateur, and a quick look at the lens confirmed that it was in excellent shape. By all means worth $20, and then he threw in a set of filters as lagniappe. Vivitar was an American lens and accessory distributor who contracted design and construction to a number of Japanese manufacturers. 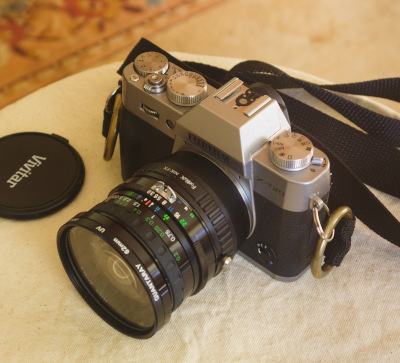 The 19mm f/3.8 was almost certainly made by Cosina. The original owners of Vivitar eventually passed away and the name has been sold and resold, but Cosina has continued as a corporate entity and is one of the powerhouse Japanese optical companies today. In one of the ironies of corporate life, Cosina bought rights to the fabled Austrian Voigtlander name and now makes Voigtlander Bessa DSLRs and Voigtlander lenses for Leicas and other cameras. Just to make it clear to the Germans where the center of gravity now lay, Cosina went on to build Zeiss Ikon digitals with Leica M bayonet mount. Effectively, they gathered in two of the last three prestigious German brands, leaving only Leica to carry on making what I have heard described as "fetish objects for wealthy amateurs". The little Vivitar on my X-T20 is the equivalent of a 28mm lens on full frame, which would have been very wide 50 years ago, but of course now 16s and 20s are mainstream. The Vivitar, built for Nikon, has the vestigial ears for communicating aperture settings to the vintage pre-automatic Nikons of the 1960s and early 1970s, but the lens is fully manual on the Fuji adapter. The lens is sharp enough, especially stopped down to 5.6 or 8, there's not much distortion, overall it's decent optically. As noted in some of the reviews, it does flare unless the sun is at your back, and I have ordered a hood to maybe help hold it down. But the best thing is the old film-style color, the same as I like in my Takumars. The wide angle gives a completely different perspective to what I am used to, and it has been fun to experiment with. 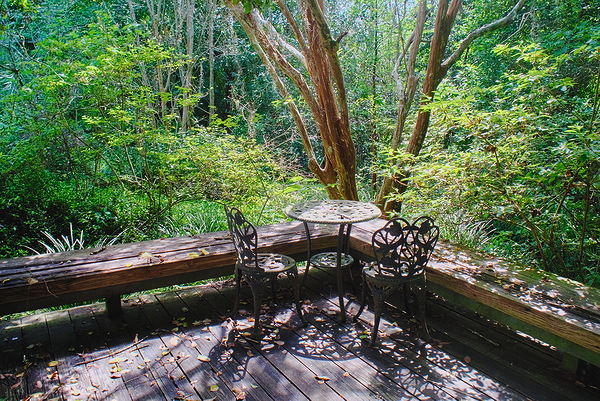 The picture above was taken in the back yard of my mother's house in Ocala, Fujifilm X-T20, Vivitar 19mm f/3.8. And the picture of the camera and lens was taken with my trusty Pentax K100D backup rig. This picture helps capture the absolute desolation of Allendale County. It seems that someone else passed through Allendale County in 2015 and was impressed with the collection of derelict motels. He matched up the ruins with postcards from the heyday of pre-Interstate 95 tourist traffic and was able to identify many of them. If, like me, you have a morbid interest in economic and social decline, you might enjoy his web post, The Tobacco Trail Through Allendale County. Highway 301 still carries some truck traffic, but the Interstate Truck Stop in Ulmer SC is long out of business. 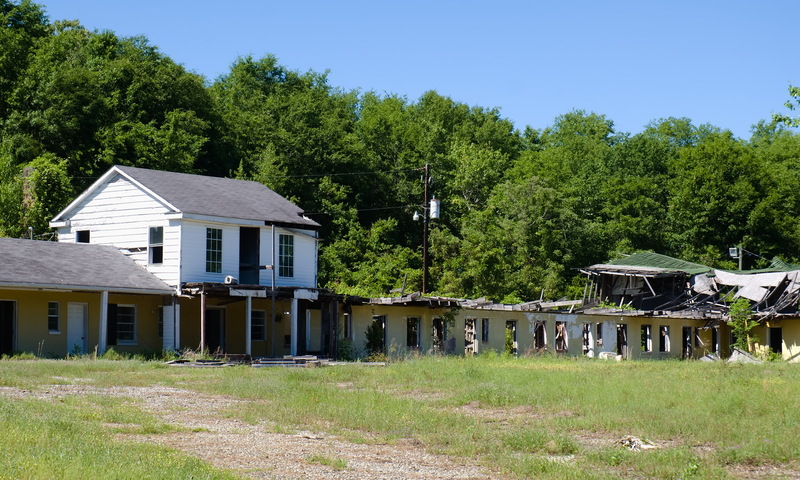 Ulmer, in the northern part of Allendale County, peaked out in 1930 with 199 inhabitants. At the last census, it had 88. U.S. Highway 301 was a good road for its day, and even now is not bad. Much of it through Florida, Georgia and South Carolina is four lane divided highway or five lane with a center passing lane, though for the most part not controlled access. Its main drawback is that it runs parallel to I-95. 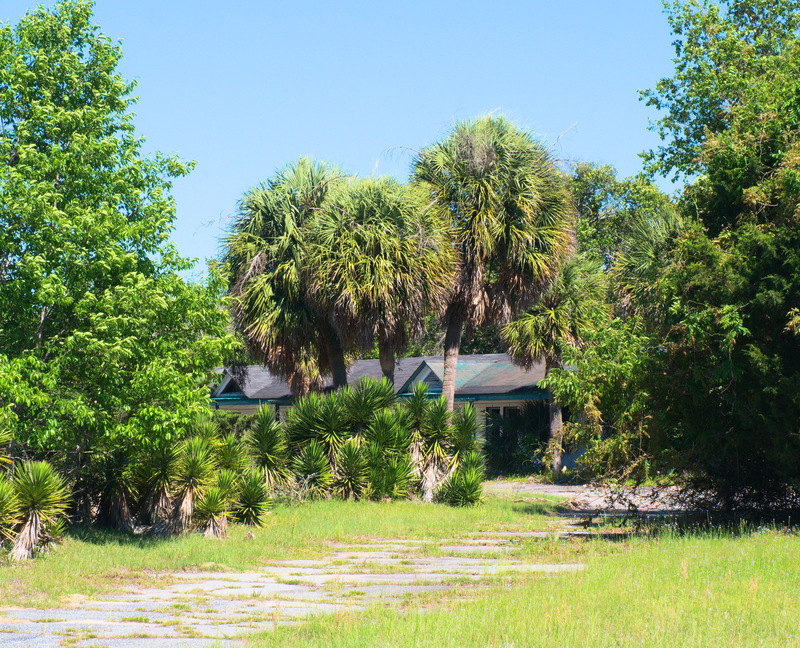 Before the interstate was built, 301 was considered one of the quickest routes from the northeast to Florida. The town of Allendale, in the South Carolina county of the same name, made a big investment back in the 1950s and 1960s. Tourists poured south down Highway 301, bound for Florida, and the people of Allendale saw great opportunity in serving them. But as I-95 siphoned away the traffic, the businesses of Allendale one by one failed. 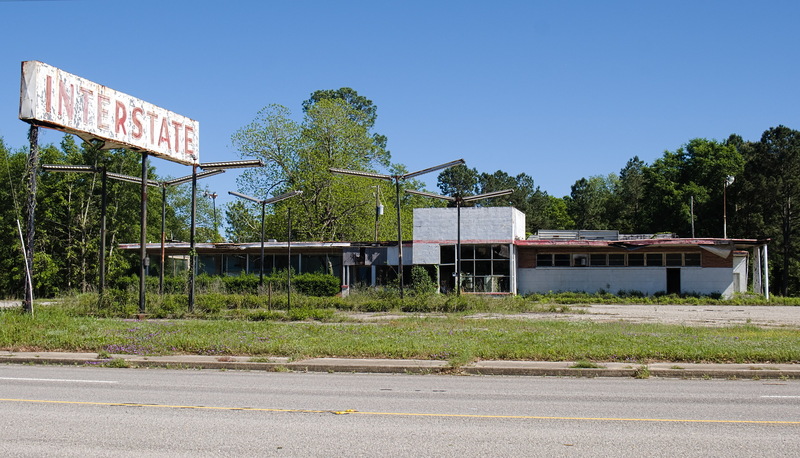 Now Highway 301 in Allendale County is lined with derelict buildings. I counted nine motels in ruins, plus numerous gas stations and restaurants Even the attractive State Visitors Center just north of the Savannah River crossing from Georgia has been closed. Of all the county seats in low country South Carolina, Allendale looks the worst. For anyone looking to travel between central or western North Carolina and Florida, dropping down I-77 to Columbia, then following U.S. 321 to Ulmer and picking up U.S. 301 to Florida is a good route. It's not as quick as I-95 on a good day, but it is far better on one of the big Interstate's increasingly frequent bad ones. 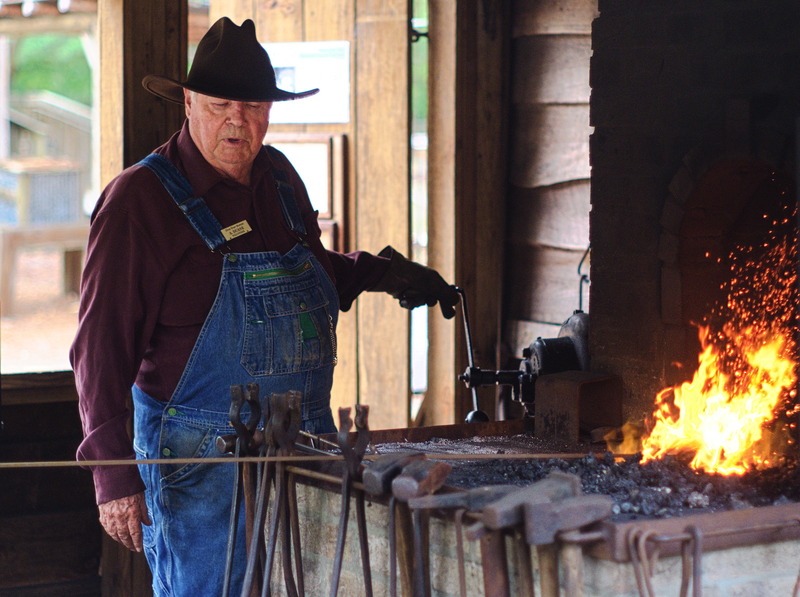 A blacksmith at work at the reconstructed 1800s homestead at Silver Springs State Park. Fujifilm X-T20, SMC Takumar 55mm f/2. It seems like a strange assignment for a GP30 built in 1963. The EMD GP30 line was a turbocharged 2250 horsepower four axle 567-powered road engine, designed for moving merchandise rapidly on the main line. It sported a distinctive hump-backed profile, courtesy of the GM Automotive Styling Center. 2111 started life as C&O 3029. It was rebuilt in the early 1980s, retaining its turbo but derated to 2000 horsepower. At some point the engine, along with several sisters, was sold to Alabama & Gulf Coast Railroad, where it soldiered along for a few more years. Eventually the A&GC sold the engine to Conrad Yelvington Distributors of Daytona Beach, FL. Renumbered to 2111, she labors on in 2019, moving long strings of hoppers through the aggregate yard at Wildwood. The work is about as far from her original purpose of hustling merchandise at speed from division point to division point. The string is moved a car length at a time across a dump trough. The engine idles as one worker hoses down the load from an overhead catwalk to hold down dust, and then another operates mechanism to dump the load. Then the engine blasts three shorts on its polished brass horn, spools up, moves the string one car forward, and idles back down. The process is repeated until the whole string is unloaded. 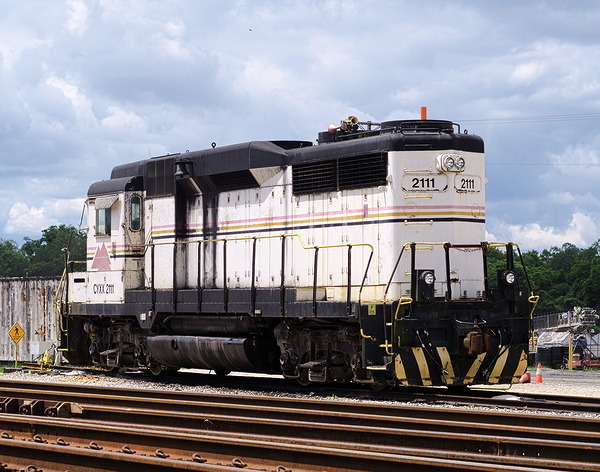 It's hardly an ideal application for a high-horsepower, turbocharged diesel, but it is a testimony to the rugged reliability of the old EMD 567 engine. 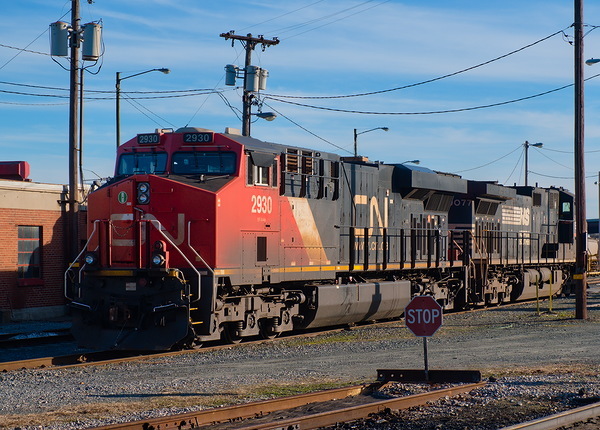 Anecdotal evidence suggests that the C&O GP30 rebuilds were very reliable, and the fact that Conrad Yelvington runs a small fleet of them suggests that it is true. The various Conrad Yelvington facilities are a real bonanza for fans of ancient diesels. The company operates several old Alcos, including a couple of S2s, built between 1940 and 1950. I photographed an RS1 at their Ocala facility in 2018. An anhinga perches on a sculpture at the edge of the lake at Tuscawilla Park, Ocala FL as it dries its wings. Fujifilm X-T20, Super Takumar 150mm f/4. 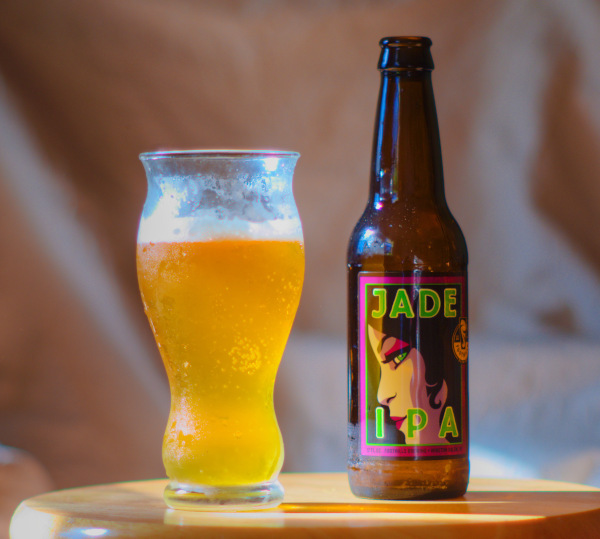 Independent craft breweries have sprung up everywhere, and I enjoy trying the local ale when I travel. Florida has about 200 breweries. One of them is High Magnitude Brewing of Gainesville. They started in 2012 and seem to be doing well. 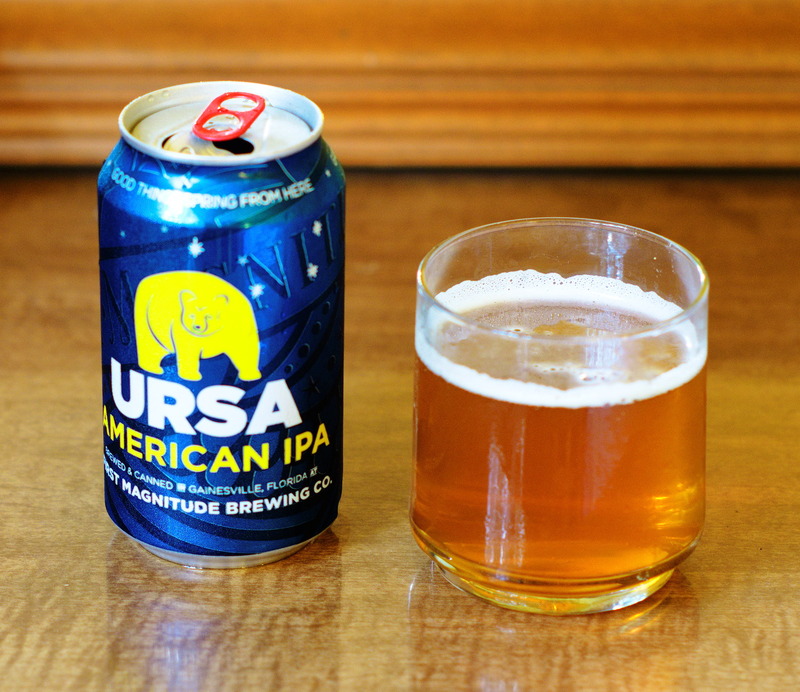 Their Ursa is a hoppy, fairly strong American IPA, just my style. I doubt if they will ever get distribution in North Carolina, but I will be sure to enjoy a six-pack on my frequent trips to Florida. Gainesville is a fun place to visit, so next time I am there to walk through Kanapaha Gardens and have a slice at Leonardo's, I may finish the day with a couple of drafts at the First Magnitude tap room. Fujifilm X-T20, SMC Takumar 55mm f/2. Miller Park. Fujifilm X-T20, Super Takumar 150mm f/4. Hi-Wire Brewing of Asheville makes more than just IPA, Bed of Nails for example. A taste will leave no doubt it's an ale, but not so hoppy and bitter as an IPA. I like it, Joe likes it, even Marcia likes it. 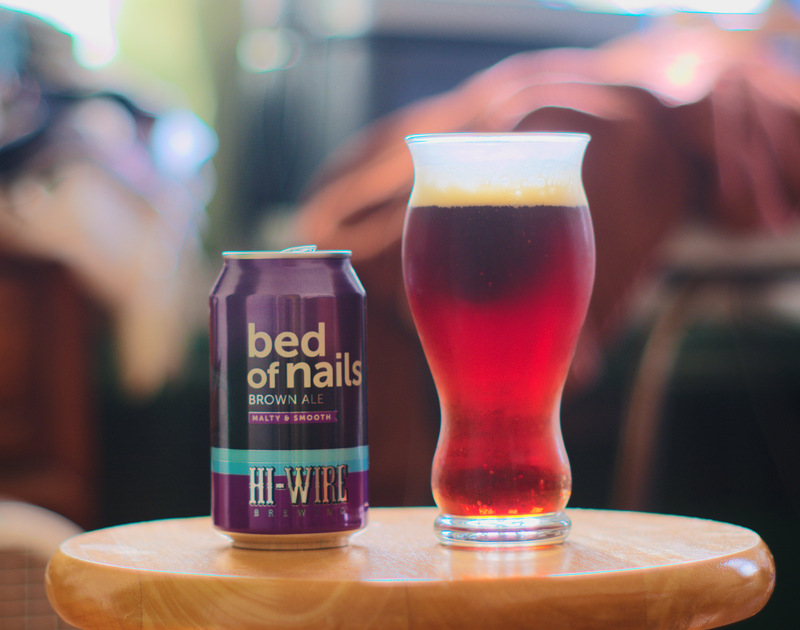 And yes, Hi-Wire even brews (gulp) a lager. They've been around a while and have enough cred to get away with it. Plus, a gose. Who else brews a gose? Fujifilm X-T20, SMC Takumar 55mm f/2. South Carolina doesn't have as many microbreweries as North Carolina (around 50 as compared to better than 300), but it's coming along. Westbrook Brewing Company of Mount Pleasant has been around since 2010. 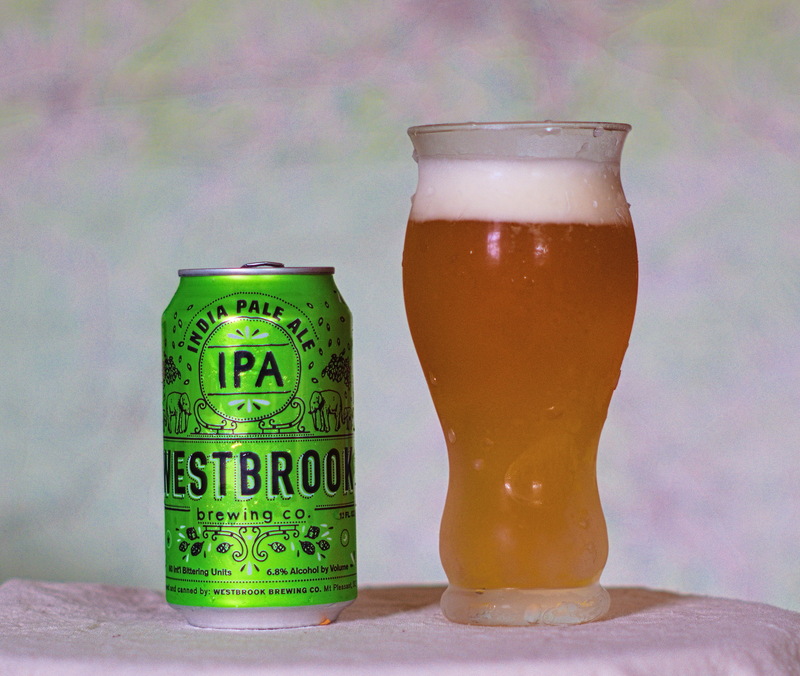 Their IPA is inoffensively tasty, not as hoppy, bitter and strong as Jade or Garden Party, but still unmistakeably "IPA". Fujifilm X-T20, SMC Takumar 55mm f/2. 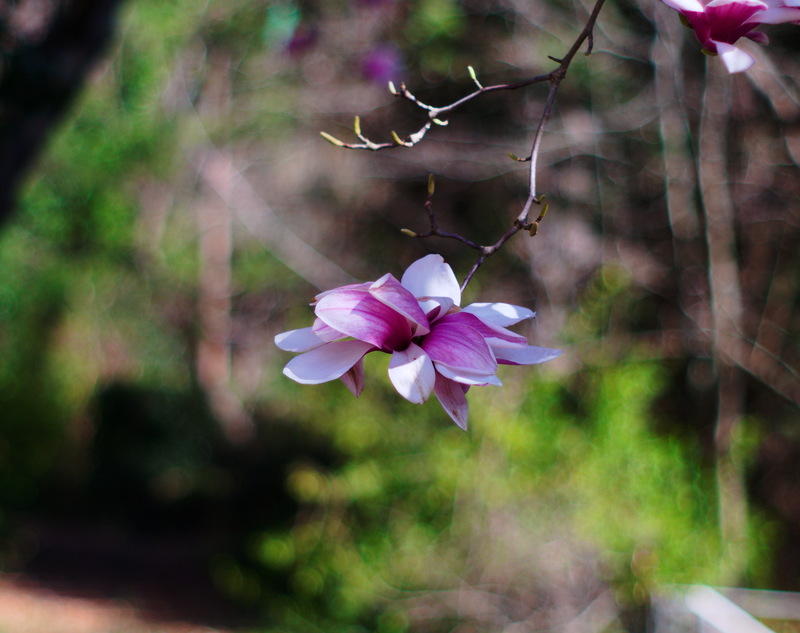 Some form of magnolia, I believe. Fujifilm X-T20, SMC Takumar 55mm f/2. So, the Flaming Lips wrote Yoshimi Battles the Pink Robots in, I suppose you could say, homage to Yoshimi P-We, drummer for the Japanoise bands Boredoms and OOIOO. Starting with the Wikipedia entry for Yoshimi Battles the Pink Robots, we find that the Lips felt that "her machine-sound abstract singing sounds like she is battling monsters". Following links to other Wikipedia pages (in other words, going down a rabbit hole), we find that another member of Boredoms was "Chew Hasegawa (now of Japanese funeral doom band Corrupted)". So what is Funeral Doom? Wikipedia classifies it as a division of Doom Metal, which, of course, is a sub-genre of Heavy Metal, which could be called a top-level genre of Rock. Arguably, Black Sabbath was right up there with the Beatles and Stones as a God of the Stone Age. Funeral Doom is "played at a very slow tempo, and places an emphasis on evoking a sense of emptiness and despair. Typically, electric guitars are heavily distorted and dark ambient aspects such as keyboards or synthesizers are often used to create a 'dreamlike' atmosphere. Vocals consist of mournful chants or growls and are often in the background". Funeral Doom has a lot of cousins in the Doom Metal family. Wikipedia lists the following - Black Doom; Depressive Suicidal Black Metal; Blackened Death-Doom; Death Doom; Drone Metal; Epic Doom; Gothic-Doom; Progressive Doom; Sludge Metal; Stoner Metal; and Traditional Doom. Wikipedia notes that there are several regional variations of Doom Metal, including "one of the greatest doom metal outputs", Finnish Doom Metal. Stateside, we have Louisiana Doom Metal, Washington D.C. Doom Metal, Pacific Northwest Doom Metal (wonder if Kurt was playing that when he changed his name? ), and Palm Desert Scene. Yoshimi Battles the Pink Robots. I could follow this hole a lot deeper but I have a feeling it would never come to an ending. Signing off, not to "Dixie", but to Mournful Congregation's "Scripture Of Exaltation And Punishment". 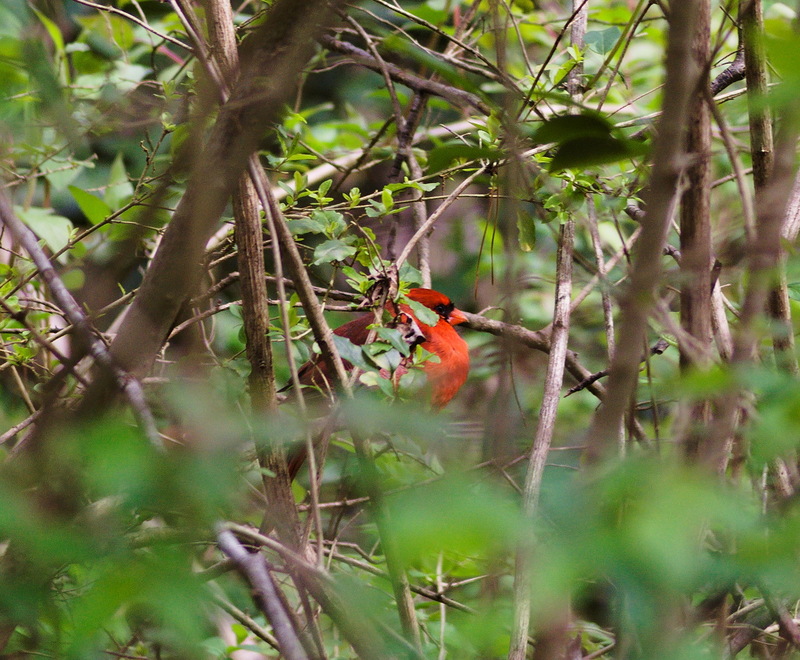 Cardinal in a bush in Miller Park. 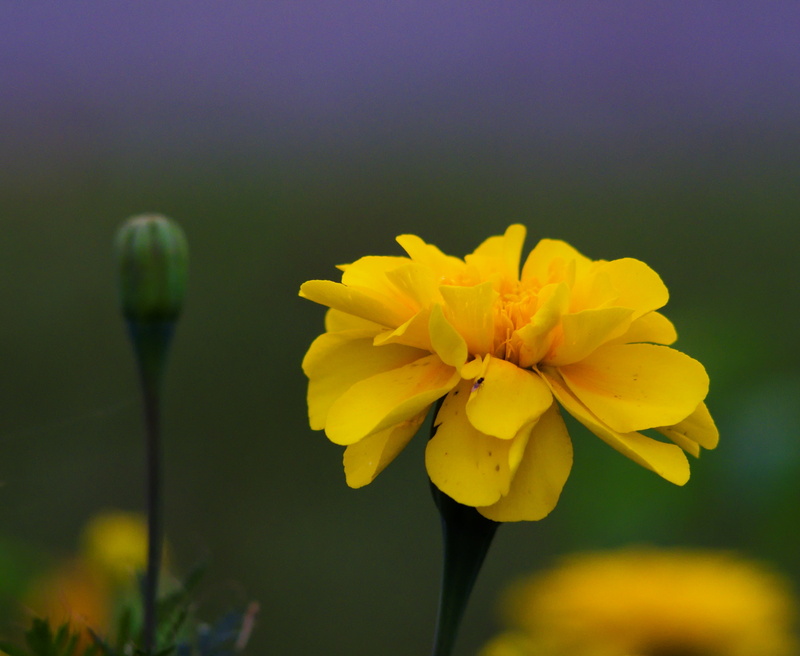 Pentax K100D, SMC Pentax F 80-200mm f/4.7-5.6 at 200mm, f/8, 1/320s, ISO 400. 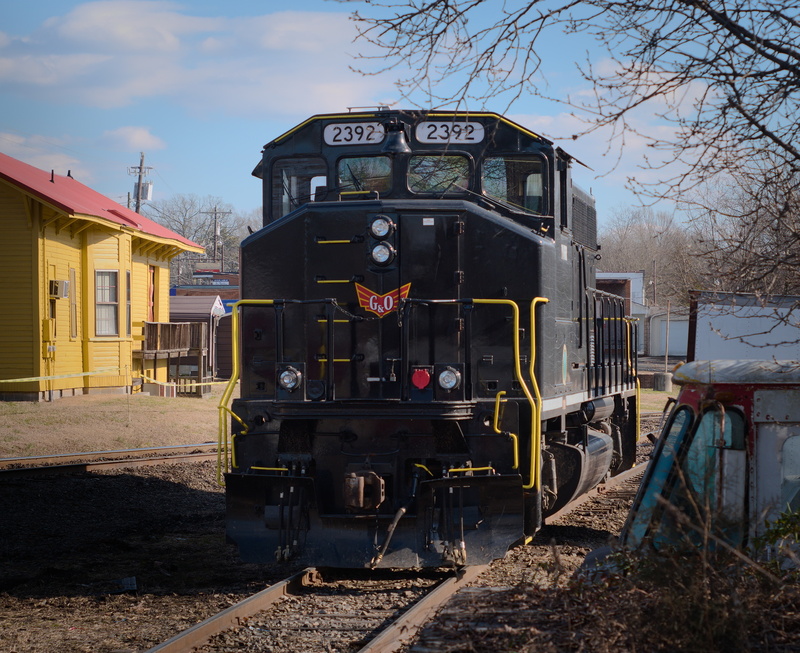 Yadkin Valley Railroad runs two lines out of Rural Hall, NC, one to North Wilkesboro and the other to Mount Airy. 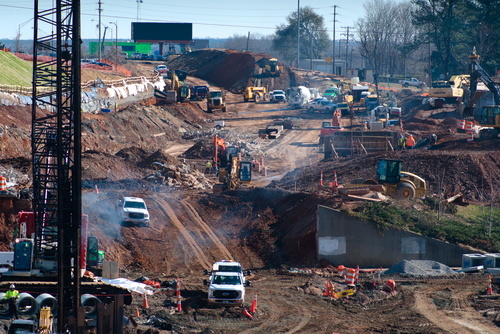 Interchange with Norfolk Southern is done via trackage rights at Liberty Street yard in Winston-Salem. 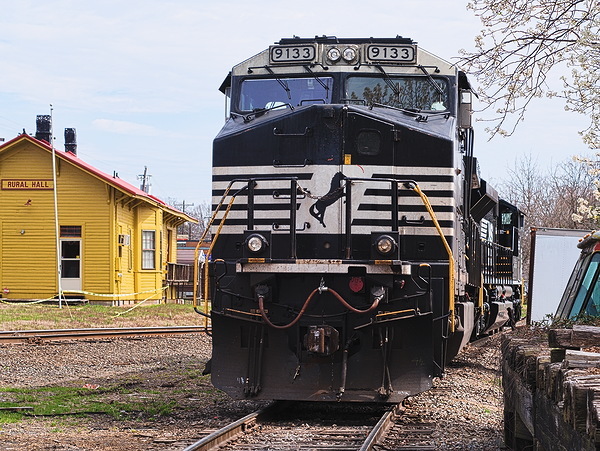 Norfolk Southern kept the Winston-Salem - Rural Hall line as it had enough traffic to make it worthwhile. One lucrative operation is movement of unit trains of ethanol to Hot-Z Transport Company's transloading facility in Rural Hall. These can be heavy trains. I recently found a standard NS 12-axle road set, EMD SD70 1196 paired with GE D9-44CW 9133, switching the Hot-Z track, tying up the entire Rural Hall yard and periodically blocking Highway 66 in the process. 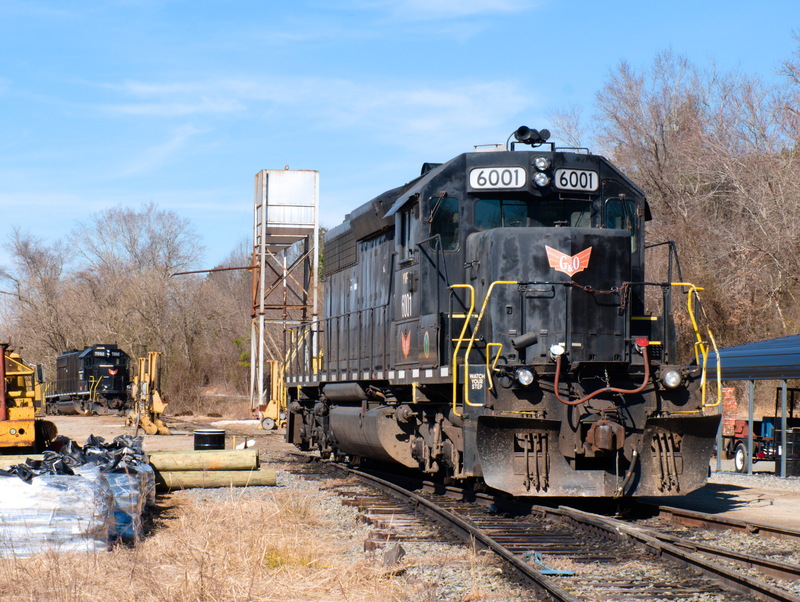 The Yadkin Valley train from up the river waited west of town until Norfolk Southern finished their work and cleared the through-track. Then it came through to run to Winston-Salem with interchange traffic. The NS units spent the night idling on the side track near the old depot. 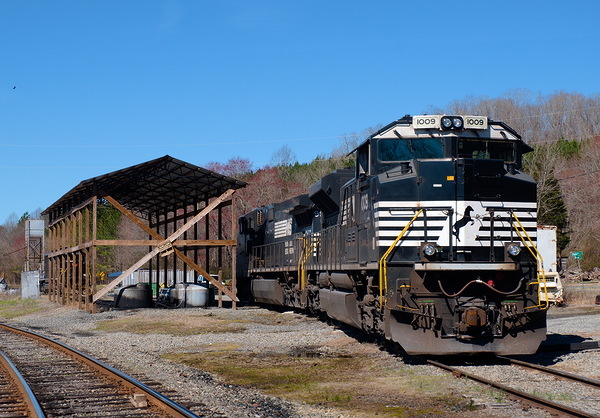 Perhaps the next day 1196 and 9133 ran out to Donnaha to Yadkin Valley's open-air maintenance facility. Lately I have seen foreign road engines there, and have wondered if Yadkin Valley was doing contract maintenance for the other lines. The other day I found a CSX engine at Donnaha getting washed, so perhaps that is the service being provided. This is purely speculation on my part, but maybe NS and CSX are leasing space at Donnaha to have non-union contractors wash engines, rather than have railroad employees do it in their own facilities. Westinghouse, now Siemens, operates a turbine production plant outside of Rural Hall, with a long, winding light-rail spur from the Yadkin Valley for rail shipments. My guess is nothing has gone out by rail in decades, but the right-of-way is still intact. Google Street View from 2013 shows the rail lifted from Tobaccoville Road onward, but a recent visit found the road crossing recut and rail relaid into the plant. A slug of derelict cars, tagged by local satan-worshippers, was spotted near the road. Again, speculation, but is YVRR trying to show evidence that the spur is still in use, to stave off local efforts to have it removed? I seriously doubt they expect to get any business from the turbine plant, but if the plant is someday repurposed as a warehouse or break-bulk facility the railroad might get some carloads out of it. On out Tobaccoville Road, the spur into the cigarette plant has been lifted, leaving just a short siding. YVRR has spotted a wrecked covered hopper on the remnant, again perhaps to assert their property rights against adverse possession or condemnation procedures. 20 years ago I thought the lines to North Wilkesboro and Mount Airy almost certainly would be abandoned, but YVRR is proving me wrong. They are aggressively pursuing opportunities to increase revenues and resolutely defending their properties. Railroading in the upper Yadkin Valley has never looked this good, at least in my lifetime. Foothills Brewery's premium IPA. Fujifilm X-T20, SMC Takumar 55mm f/2, f/2, 1/320s, ISO 250. 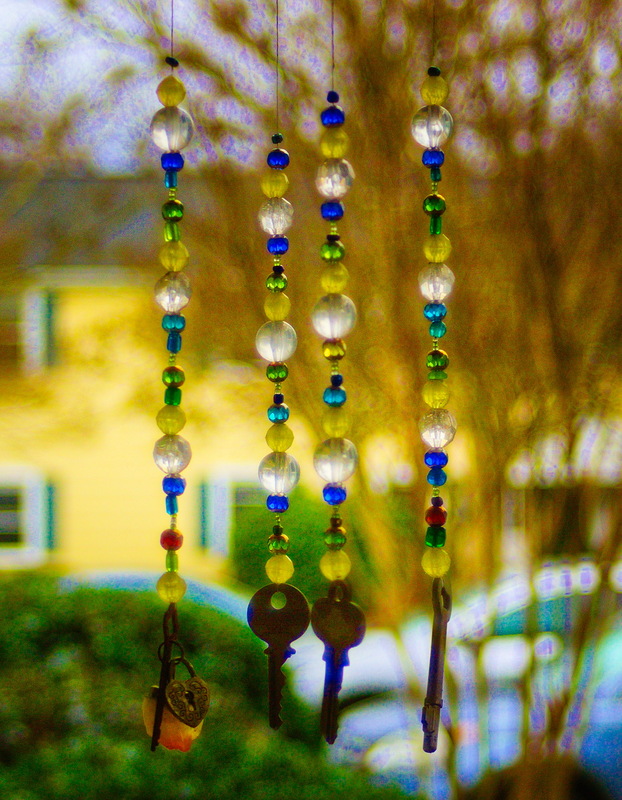 A shot of Amy's mobile on a cloudy day without the heavy backlight of the previous examples. The lens, a Quantaray 28-90 Macro zoom, is one from a box of lenses that Joe and Marcia found at a yard sale. I didn't expect much of it, but have been pleasantly surprised. Quantaray is a house brand of Ritz Camera and many of the Asian manufacturers have produced them over the years. Pentax K100D, Quantaray 28-90 Macro f/3.5-5.6, 55mm atf/4.5, 1/500s, ISO 200, cropped and processed. 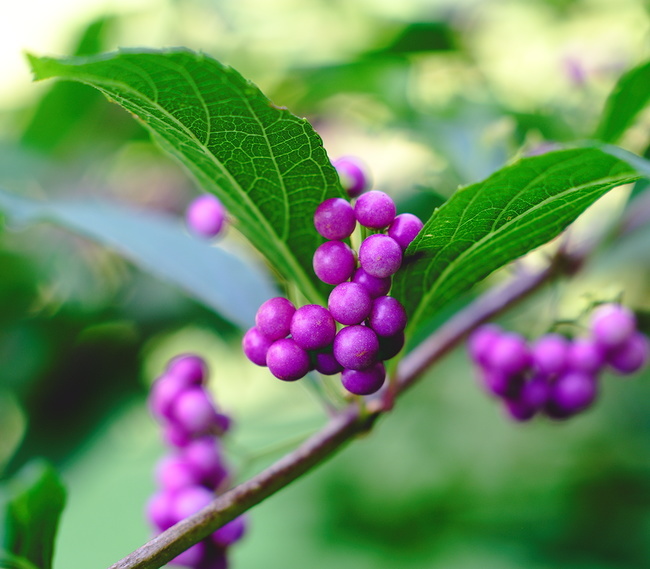 Just about to burst into bloom. Fujifilm X-T20, SMC Pentax F 80-200mm f/4.7-5.6, 1/850s, ISO 800, cropped and processed. 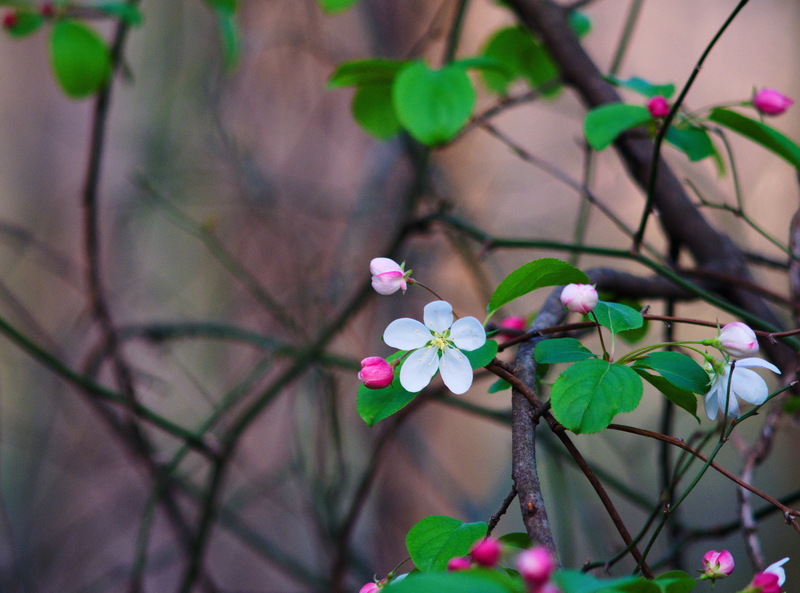 Finally enough warmth and sun to bring out a few blossoms. 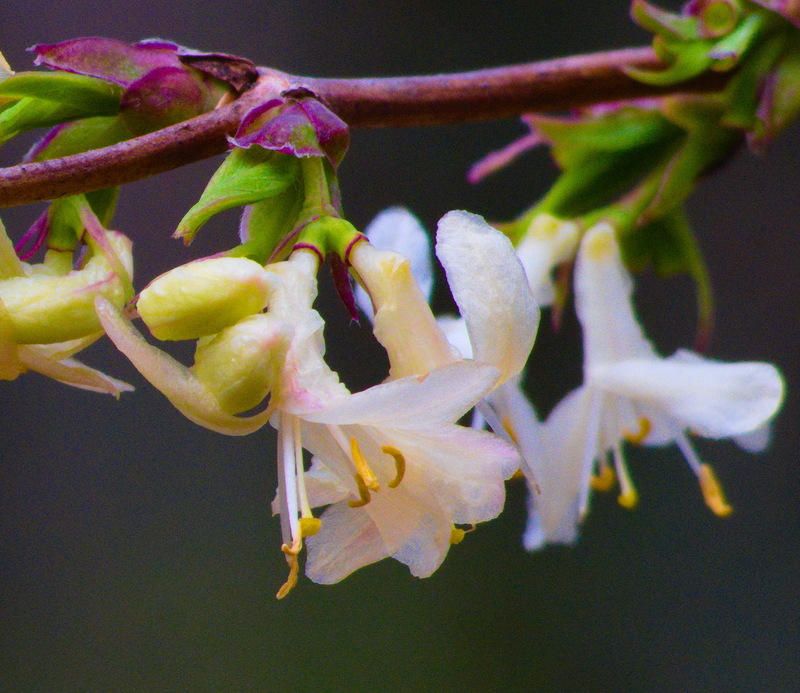 But it will be back into the low 20s tonight and tomorrow night, so today will be the best opportunity for flower pictures for a while. Fujifilm X-T20, SMC Pentax F 80-200mm f/4.7-5.6, 1/250s, ISO 800, heavily cropped and processed. The engine, shown on the northwest quadrant of the wye at Barber, was built in 1969 and rebuilt in 2006. Fujifilm X-T20, SMC Takumar 55mm f/2, f/8, 1/600s, ISO 400. The culmination, the quintessence, the epitome of the art rock tradition that started with King Crimson and Pink Floyd is the Oklahoma band The Flaming Lips, and if you don't believe it, check out the Youtube video of their 2017 live performance. This is one of the most bombastic, theatrical performances I have ever watched, just what Pink Floyd would have done back in the day if they had possessed the technology. Truly amazing, and best witnessed under the influence of acid, alcohol and Ambiens I've been told. I don't know about the Ambien, but evidently I still have enough residual acid and alcohol in my system 40 years later to still get the effect. For the song "Unicorn" lead singer Wayne Coyne rides on stage and then out through the crowd on a life-size anamatronic unicorn wearing rainbow colored wings, for their cover of David Bowie's "Major Tom" Coyne rolls around above the crowd in a giant bubble. All the while laser rays shoot through clouds of steam and smoke. The music itself is primo art rock, complex, sophisticated and virtuosic.This video cries out for a big screen and first-class sound system. It is definitely something you want to check out, provided you are not given to seizures or flashbacks. For the Floyd fans, check out the Lips' Flaming Side of the Moon Session. 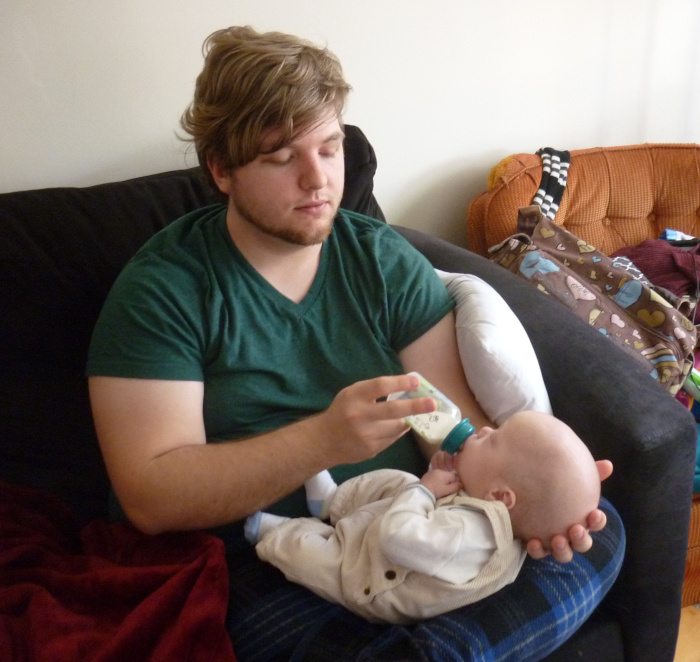 Again, not if you are prone to seizures. 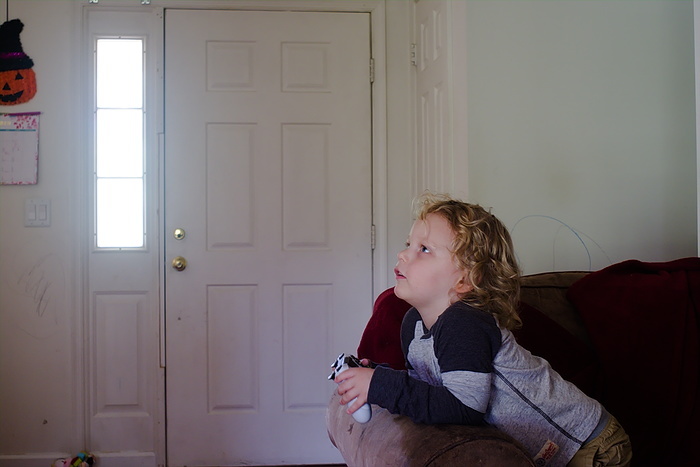 The picture is a screen shot from the first video. Recently I found this SD70AC/D9-44CW set at Yadkin Valley's Donnaha servicing facility. The EMD/GE combo seems to be a standard for NS, putting twelve axles and close to 9,000 horsepower to the tracks. 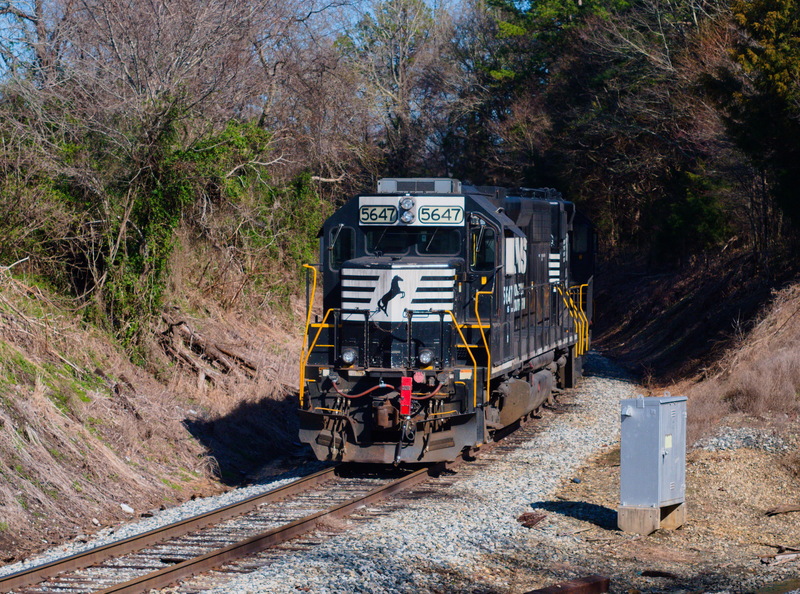 just what's needed to move heavy trains over the curvy, up-and-down line from Roanoke to Winston-Salem. Seems like overkill for the Yadkin Valley line, though. I don't know for sure these engines came up on a train. The YV operating pattern is still unclear to me. I can tell that engines continually rotate in and out of the facility, but do they come in trains or run up light from Rural Hall? And what are NS engines doing at the YV engine terminal? Fujifilm X-T20, XC16-50 f/3.5-5.6, 45mm, f/8.9, 1/450, ISO 200. Canadian National GE ES44AC 2930, built in early 2015, photographed the evening of 2/25/19 at Gaynor Street engine facility. It's unusual to see a foreign-line unit in Winston-Salem. The red-orange paint stands out in a sea of NS and YV black.Fujifilm X-T20, XC16-50 f/3.5-5.6, 50mm, f/8, 1/135s, ISO 200. A couple of engines at Yadkin Valley Railroad's open-air servicing facility at Donnaha. I haven't been able to find either engine on a roster, but both look to be some variety of SD40. 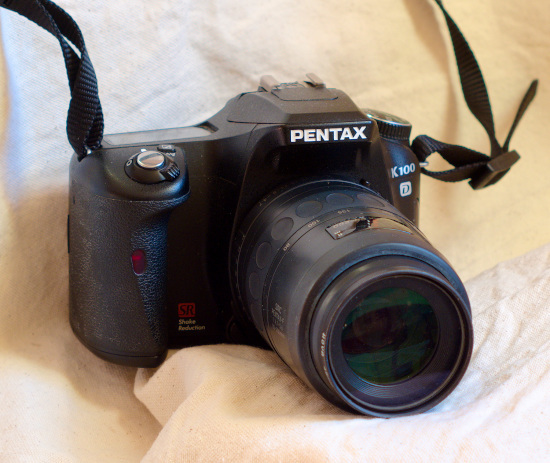 Here's the backup camera - Pentax K100D. It was state of the art when it was introduced in 2006, with a 6.1mp sensor in the new APS-C format, image stabilization, exposure compensation, and a myriad of controls and adjustments accessible through the back-mounted LCD. Even so, it is a very traditional, conservative camera. It uses the same K lens mount that was introduced back in the late 1970s on Pentax film cameras, so all the Pentax lenses from that time forward can be used. When the K mount was designed, Pentax was careful to see that lenses like their Takumars with M42 mounts could be easily adapted. Many manufacturers used M42 mounts, going back to Contax in 1949. Many hundreds of lens designs were produced in M42 format, all of which can be used on the Pentax either as-is or with slight modification. When the K100D was introduced, the single lens reflex was the mainstream for serious amateur and professional cameras, and so the K100D has a loud, clanging mirror just like an old film camera. Mirrorless technology in recent years is starting to make inroads, and my guess is that reflexes will be obsolete in another decade. The K100D is fun to use, though no fun to carry, being large and heavy compared to my X-T20. The autofocus is fast and the controls are well laid out. The limiting factor is the 6.1mp sensor. The image size produced is too small to allow for much cropping. That hurts when I am shooting distant or fast-moving objects. These old cameras can be picked up for $100 or less, making them great for backups or trainers. 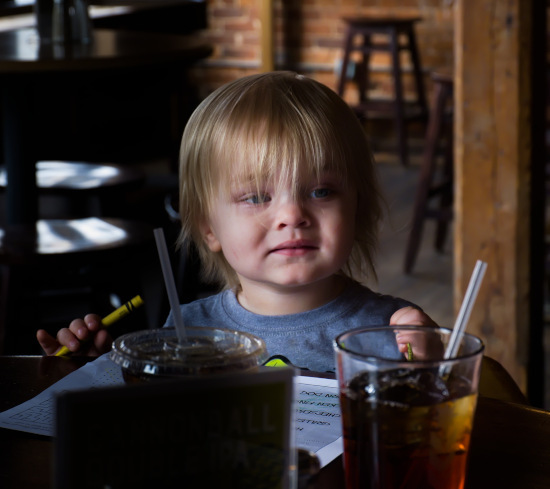 His first time to Natty Greene's. Fujifilm X-T20, XC16-50 f/3.5-5.6 at 50mm, f/5.7, 1/60s, ISO 1600. This is the rig I shoot with most of the time - an SMC Takumar 55mm f/2 on a Fujifilm X-T20 body. People mistake this for a film setup all the time. In fact, the body houses an APS-C 24mp sensor and is mirrorless, but the proportions are very close to those of a Pentax film slr. The main reason I bought the X-T20 was because it paired up well with my old 1970s vintage Takumar lenses. The flange focal distance is a measure of how far the back of the lens needs to be from the film or sensor. A camera with a mirror needs a lens with enough distance between the back and the sensor to provide room for the mirror in between. A mirrorless camera can handle lenses with a short flange focal distance because there is no need to make space for a mirror. And it can just as easily handle lenses with a long flange distance by using an adapter that sets the lens out the needed distance from the mount. That means most of the old long flange lenses from the film SLR days will easily adapt to a mirrorless body. The APS-C sensor is about 2/3rds the size of a "full frame" sensor, which is the same size as a 35mm film frame. A lens designed for a film 35mm SLR, like one of my Takumars, projects an image big enough to cover a full 35mm frame. The APS-C sensor only uses the central part of the image and crops off the outer part, which is why APS-C and Micro 4/3rds are commonly called crop sensors. The advantage is that the center part of a lens' image is usually the sharpest, so the camera is only recording the sharpest part of the image. A characteristic is that the field of view of any given lens is narrower on a crop sensor camera. Since the sensor is 2/3rds the size, the field of view is 2/3rds as wide. So the field of view using a Takumar 55mm on an X-T20 is about what a 77mm lens would give on a full frame camera. In other words, a "normal" lens designed for full frame acts like a short telephoto on a crop sensor. I like shooting short tele, so to me it is an advantage, but the flip side is to get wide angle requires a very wide angle lens indeed. There are some other differences between crop and full frame, like pixel density and low light performance, but that is too technical to get into here. Of course, to get a picture of my X-T20/Takumar combination, I had to use another camera. My backup is a Pentax K100D, an older 6mp crop sensor DSLR. Takumar was the brand name for Pentax lenses back in the film days, and Pentax was careful to design their digital cameras so all the old lenses would easily adapt to them. 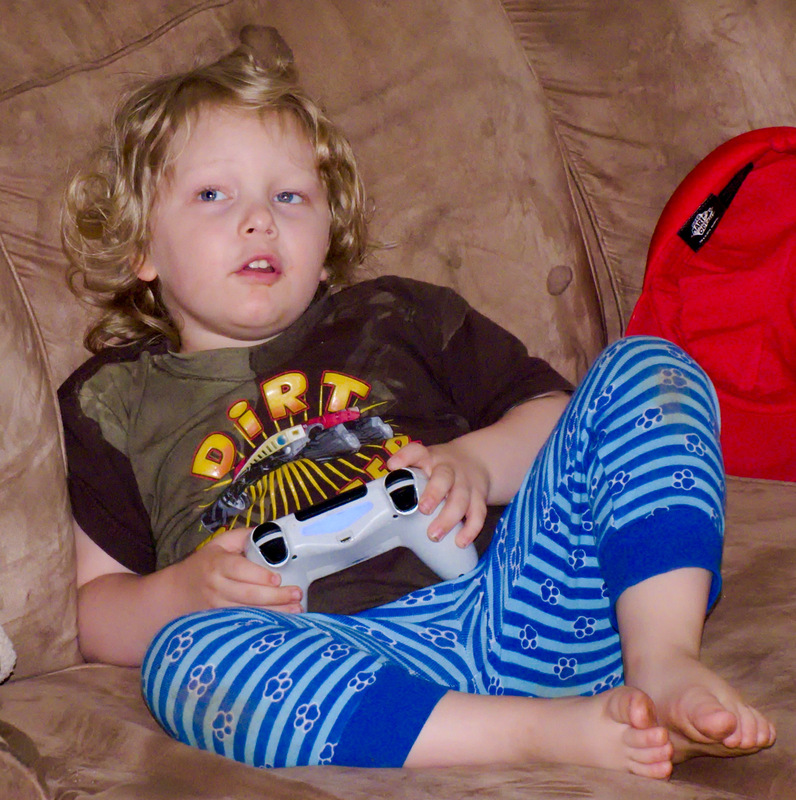 So all my Takumars, plus more modern Pentax lenses, work fine on the K100D, just as they do on the Fujifilm. The new Pentaxes are fully automatic on the K100D, while on the X-T20 they, like the Takumars, have to be manually focused and exposed. Of course, Fuji has their own line of very fine quality modern lenses that are fully automatic on the X-T20 body. I have only one, the kit XC16-50 zoom. It's a great lens, but I almost never use it - only if I need a wide angle. I just like the colors and images that I get with the Takumars better. 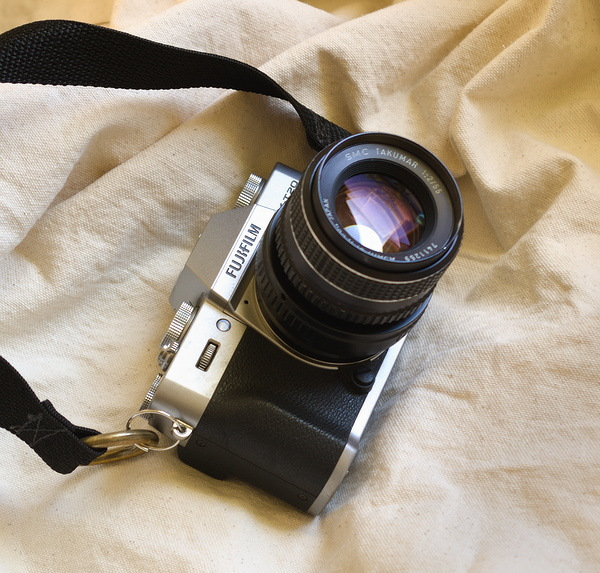 Why did I buy a Fujifilm body? I seriously considered a Panasonic, since I had several point and shoot Panasonics that served me well. Olympus as a company seemed a bit shaky, and I will never buy anything from Sony again, with their well-deserved reputation for secreting spyware and backdoors in their products. At the time, neither Canon nor Nikon offered a crop sensor camera. And Pentax was so far off the radar that I didn't even know they still produced cameras. It finally came down to Fujifilm or Panasonic. The reviews suggested some slight image quality advantages for the Fujifilm, and when the price of the relatively new X-T20 dropped to about the same as the current Panasonic Lumix, I sprang for the Fuji. Now, with around 6,000 shutter clicks on it, I'm perfectly satisfied and expect to keep it until it fails. Most digital bodies will do 100,000 or more clicks, so that could be 20 years from now. Why does Fuji call its modern digital cameras "Fujifilm"? That question I can't answer. GP40-2LW 2392 of the Yadkin Valley Railroad was built in 1975 at GMD as Canadian National 9613. She is pictured here in Rural Hall January 28th, 2019. 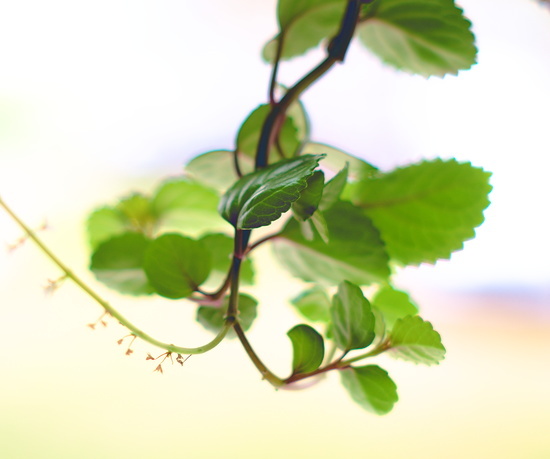 Fujifilm X-T20, SMC Takumar 55mm f/2. Interstate 40 through Winston-Salem was a good road when it was built in 1958, other than the S-Curve at Hawthorne Road that became known as "Kurfees Folly" after the mayor at the time. He reputedly pulled strings to have the dangerous feature designed into the road to keep his political allies from losing valuable commercial properties along Hawthorne Road and First Street to eminent domain. Kurfees spent the rest of his life denying the story. The curve was cursed by local drivers for many years and was the location of innumerable accidents - some of them fatal. Kurfees was a notable progressive who pushed through integration of the local fire and police forces, started the local hospital authority and saw to it that the city got a state of the art water and wastewater system. In other words, a good-government democrat. But nowadays if he is remembered at all, it is because of "Kurfees Folly". The highway was rerouted in 1992 to bypass downtown and skirt what was then the southern edge of the city. Most of the through traffic used the bypass and the old road through town was reclassified as "Business 40." Effectively it became a commuter route and shortcut for truckers in the know headed to or from Mount Airy and points north. "Kurfees Folly" was straightened out in the late 1990s. It's now 2019. Until last fall, 85,000 commuters a weekday were using Business 40 to get in and out of downtown. But today the road is closed for 1.2 miles right through the heart of town, and it will stay that way until sometime in 2020. What was a good road in 1958 is totally sub-standard now. The lanes are too narrow, the ramps are too short, and the bridges are too low. It's time for a rebuild, to the tune of $99 million, assuming the job stays on budget. The plans look good, and it should be a much better road when it is done. In the meantime, the traffic on the bypass and on the parkways has to be seen to be believed. It looks like something you would see in Charlotte or Raleigh. The new road will be a boon to commuters, but not everybody wants to commute. The demand for downtown housing has led to thousands of new apartment units being built in the last few years, and more are on the way. I drove past a big new development under construction along Brookstown Avenue, and another across the street from the old Bailey Steam Plant downtown. Bailey once provided steam and electricity for R.J. Reynolds' huge complex of factories. Now it has been repurposed as a restaurant. On a cool but sunny January workday, I found crowds of twenty and thirty-something office workers enjoying lunch hour in the vicinity. North of town the rate of development is slower. Smith Reynolds Airport is a backwater. Aviation is classified as civilian or military, and civilian aviation is classified as private or commercial. Smith Reynolds is firmly in the private category. Greensboro got all the commercial traffic with their big, modern "international" airport, and a Fedex hub to boot. 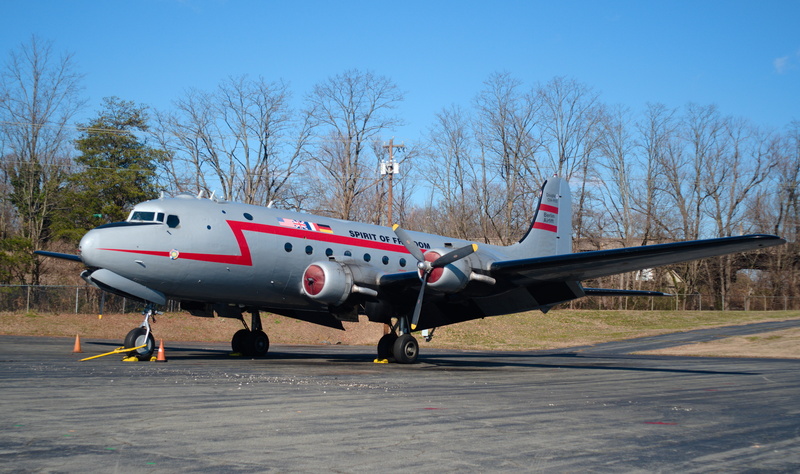 But the old Piedmont Airlines hangers in Winston-Salem are still extant, and they get some interesting visitors. Douglas C-54 "Spirit of Freedom", one of the last survivors of the fleet that carried out the Berlin Airlift in 1948 and 1949, has overwintered at Smith Reynolds for the last several years. The plane tours from airshow to airshow in the warm months. The hangers are across Liberty Street from the runways, so there is a stoplight on Liberty that only turns red a few times a year when a plane is towed across the street. That's a sight I would like to see and photograph. 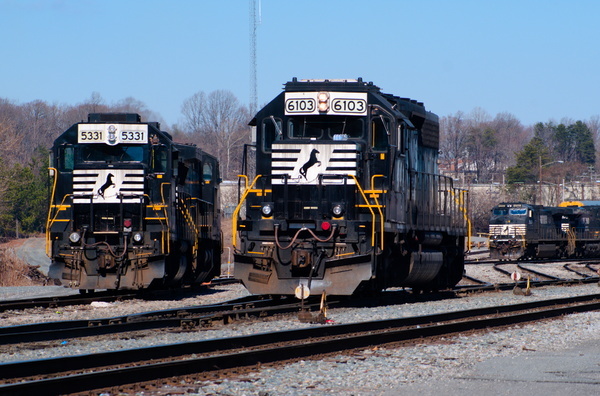 A short drive south on Liberty Street I found Norfolk Southern locomotives 5331 and 6103 idling away the day at the south end of the yard. 5331 is a GP38-2 built in 1973 for the Penn Central. That ill-fated merger of the Pennsylvania and New York Central Railroads quickly went bankrupt. Rather than see the liquidation of most of the railroad infrastructure in the northeastern United States, the government stepped in and formed Conrail. CSX and Norfolk Southern parcelled out Conrail in 1999. 6103 might look familiar. I posted a picture of the engine back in May of 2018. It's an SD40-2, of course. Ubiquitous. 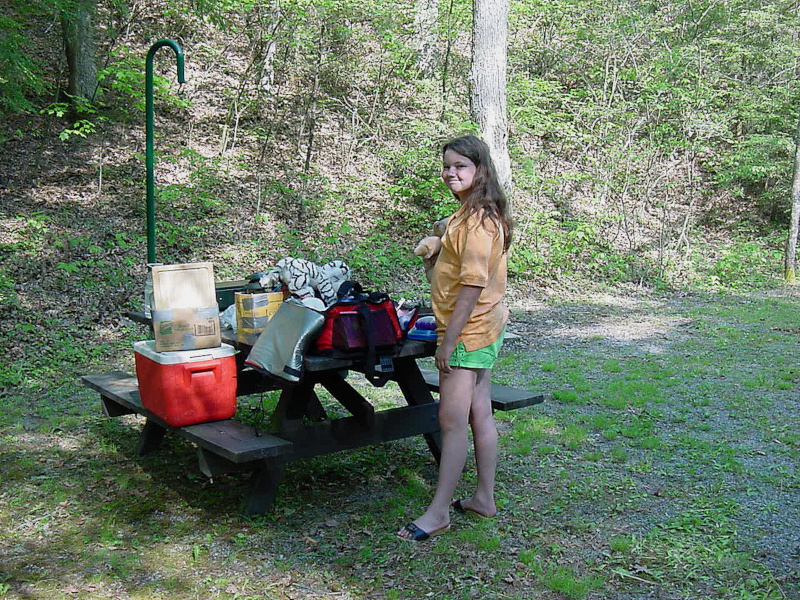 Here is a set of 46 photographs from a trip Marie and I made to Maine in 2002. 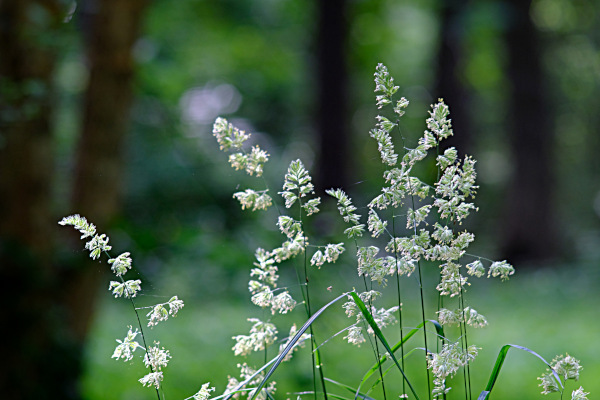 Fescue flowering in the park in late May, 2018. Taken with my Takumar 150. Their Oatmeal IPA was one of my favorites, unfortunately no longer brewed. 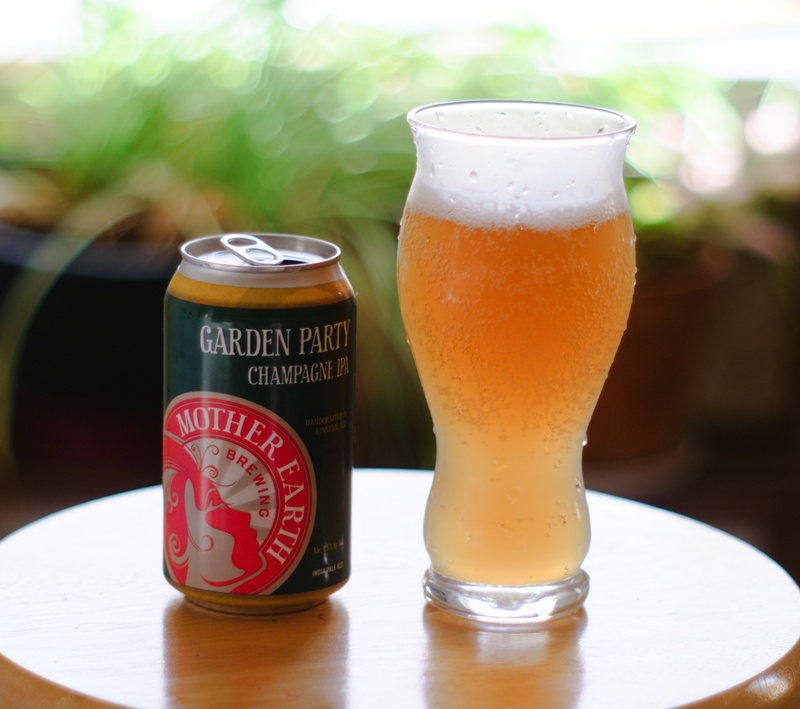 Garden Party is not quite on that level, but still a good beer, strong, bubbly, with a clean, bitter finish. Fujifilm X-T20, SMC Takumar 55mm f/2. Since it is just next door, I can walk over and take a few shots of Amy's mobile most evenings, and I have been trying different lenses. This one is with an SMC Pentax-F 80-200mm f/4.7-5.6 that I picked up somewhere along the way. The F series were the first Pentax lenses with auto-focus, produced in the late 1990s. 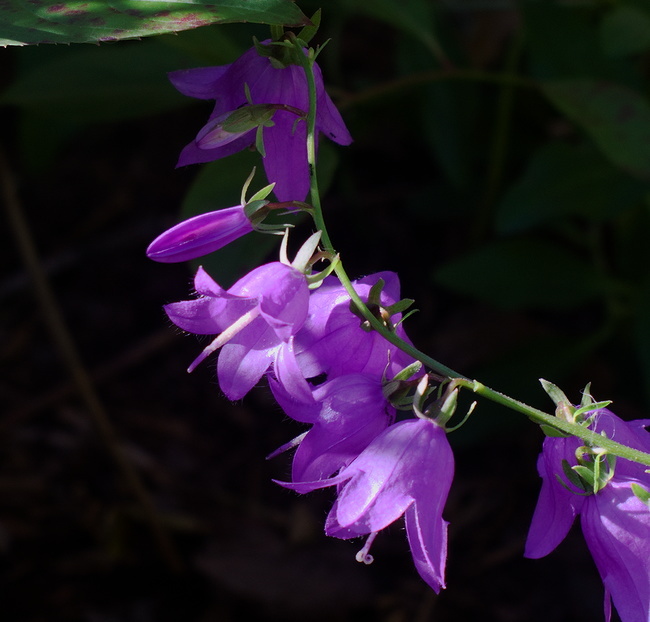 Of course, the lens won't auto-focus on the Fujifilm adapter, but it's no trouble doing it manually on a static subject. 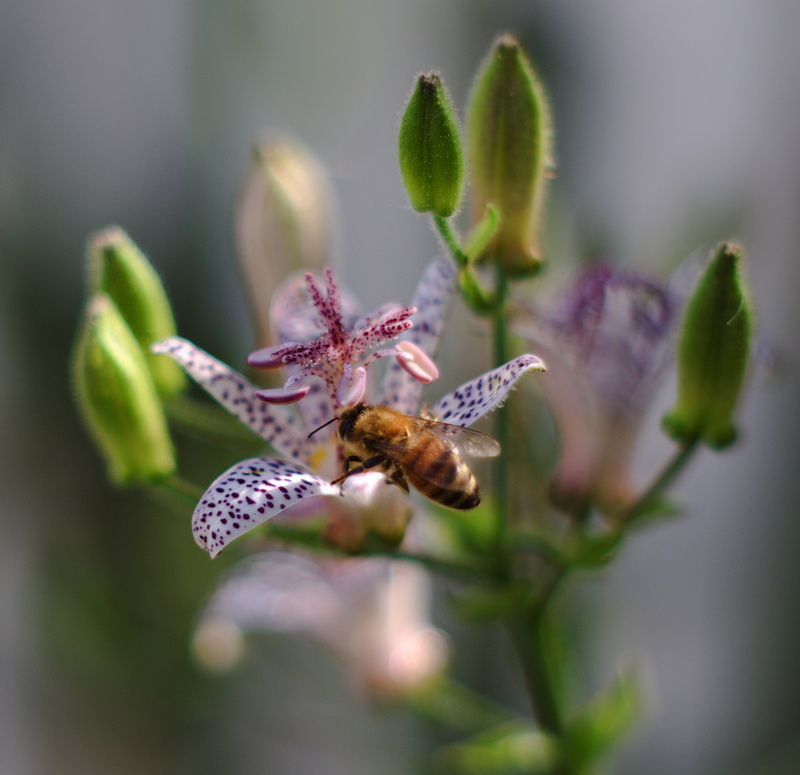 I also tried the lens on a Pentax K100D body, and it auto-focused very nicely. The lens is sharp and has good Pentax color resolution, all in all a very nice optic. It's much sharper than my Canon 70-210. It has proven a pleasant surprise. Fujifilm X-T20, SMC Pentax-F 80-200mm f/4.7-5.6 at 80mm, f/4.7, 1/1700s, ISO 200. 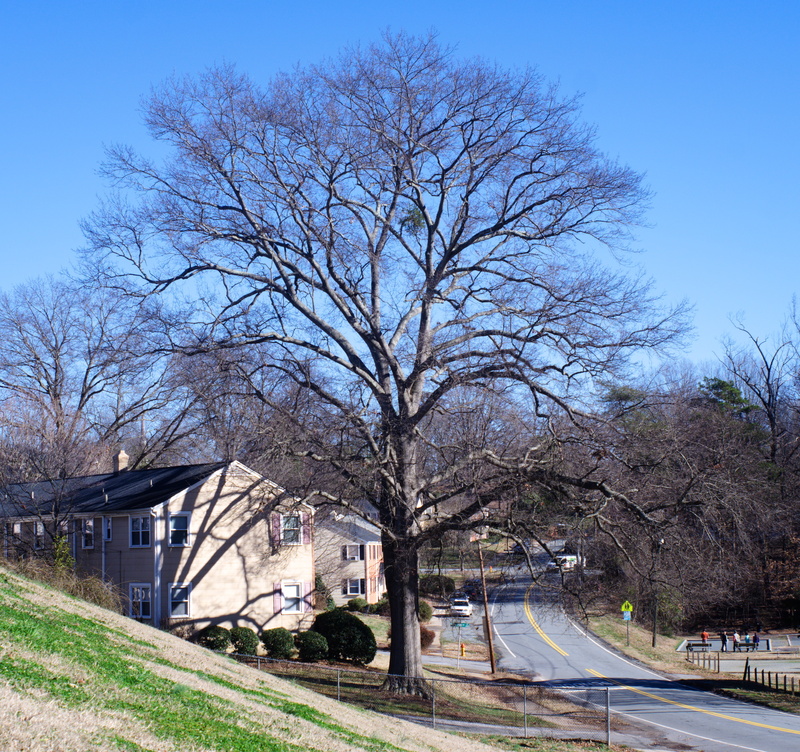 One of many big oak trees in my neighborhood, under a Carolina-blue sky. Fujifilm X-T20, SMC Takumar 35mm f/3.5, f/11, 1/170s, ISO 200. Fujifilm X-T20, SMC Takumar 55mm f/2, f/2, 1/90s, ISO 200. My neighbor makes mobiles and hangs them on her porch. 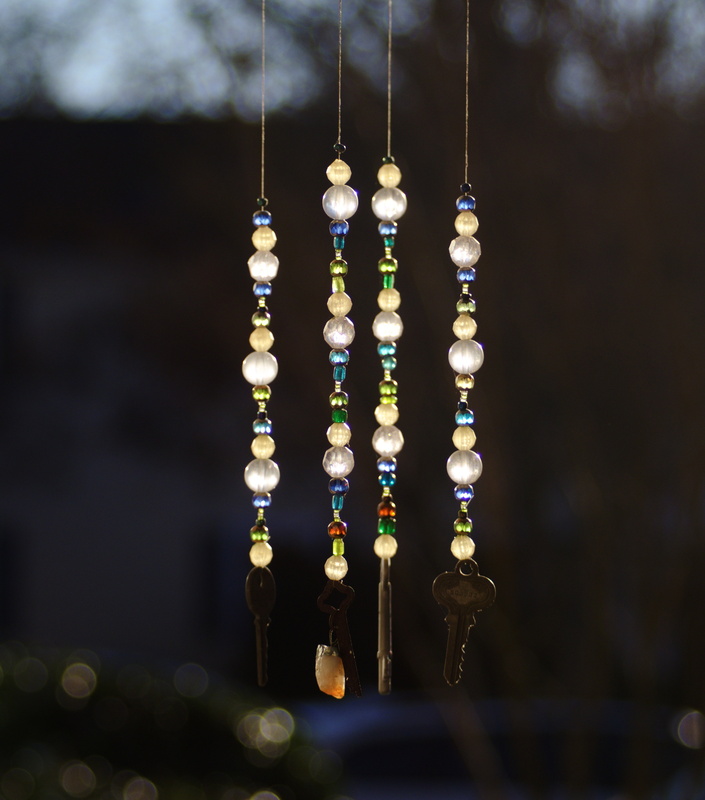 The beads refract the afternoon light, which bounces around inside my camera lens and makes gorgeous colors and bubbles. Post-processing in RawTherapee creates the oversaturation and dark, streaky background. 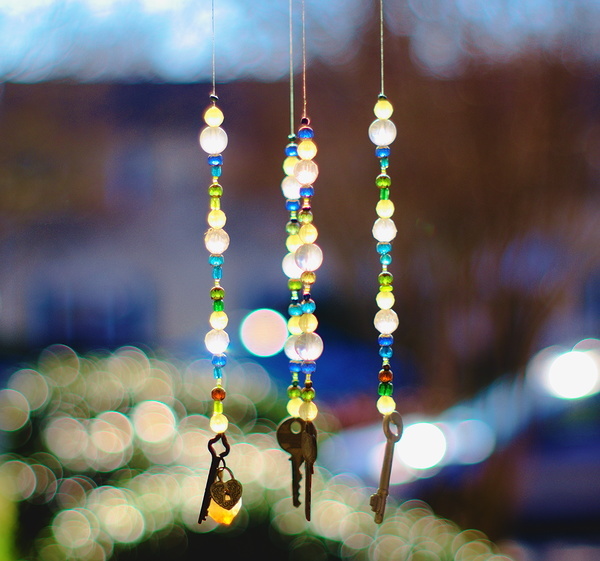 It makes for a pleasant half hour project on a winter afternoon. Fujifilm X-T20, SMC Takumar 55mm f/2, f/2, 1/1100s, ISO 200. 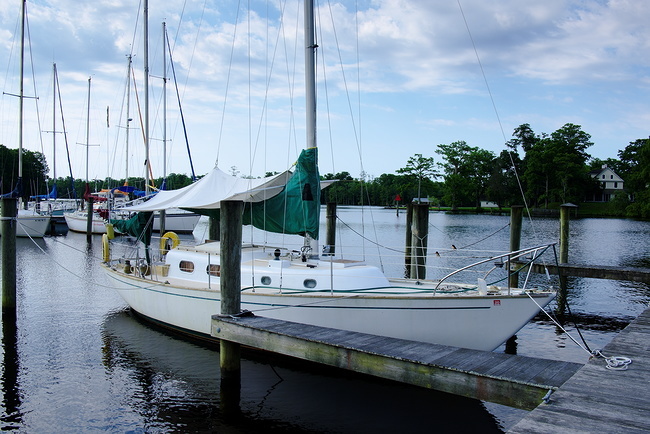 Dale and Cori lived aboard their Pearson 424 Hi Flite for ten years while they brought the boat into peak condition and worked to save money to retire. Then they made the leap to full-time cruisers and sailed away from Matthews Point Marina for the Caribbean. 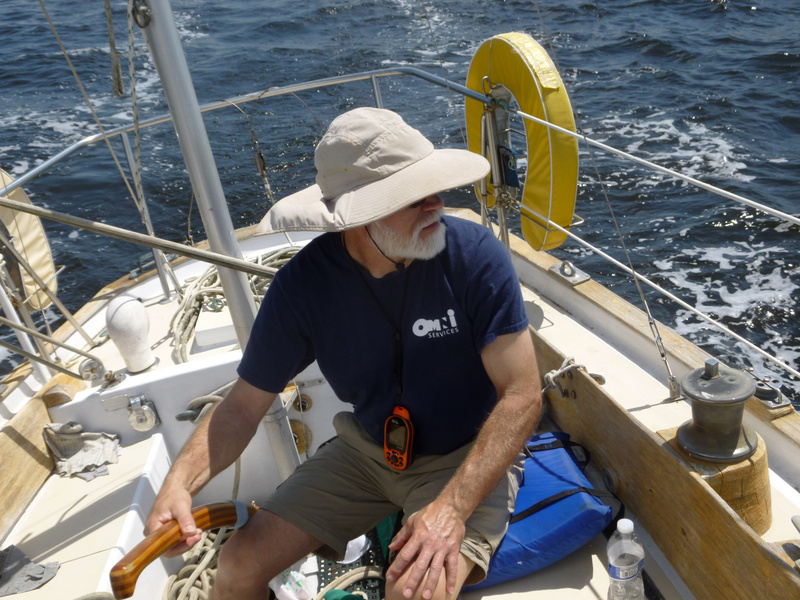 In this picture, taken in 2011, they approach the marina dock, Dale in total control at the helm, while Cori, a.k.a. "Seamonkey", prepares to snag a dockline. Two more competent, confident sailors I have never known. 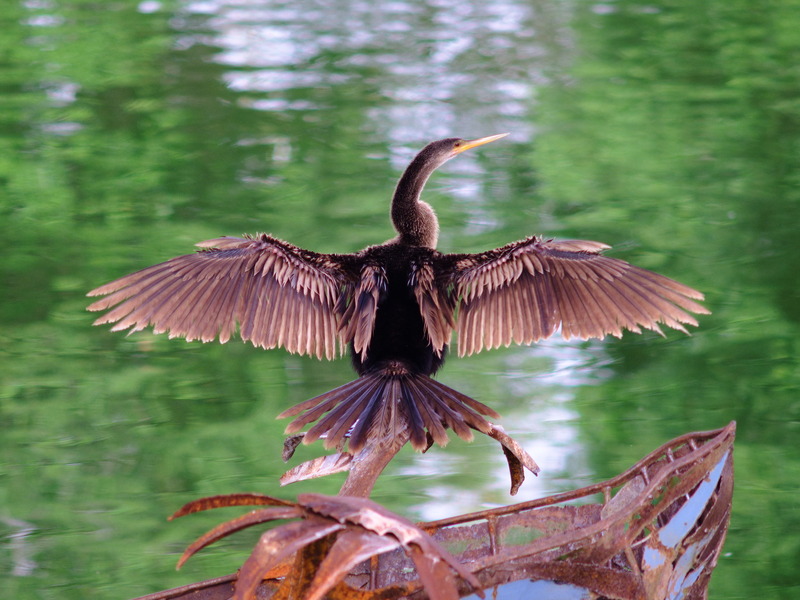 A SPOT from mid-December 2018 showed them at Morne Rouge, Grenada. Fujifilm X-T20, Super Takumar 150mm f/4 on 12mm extension tube, f/5.6, 1/320s, ISO 400. 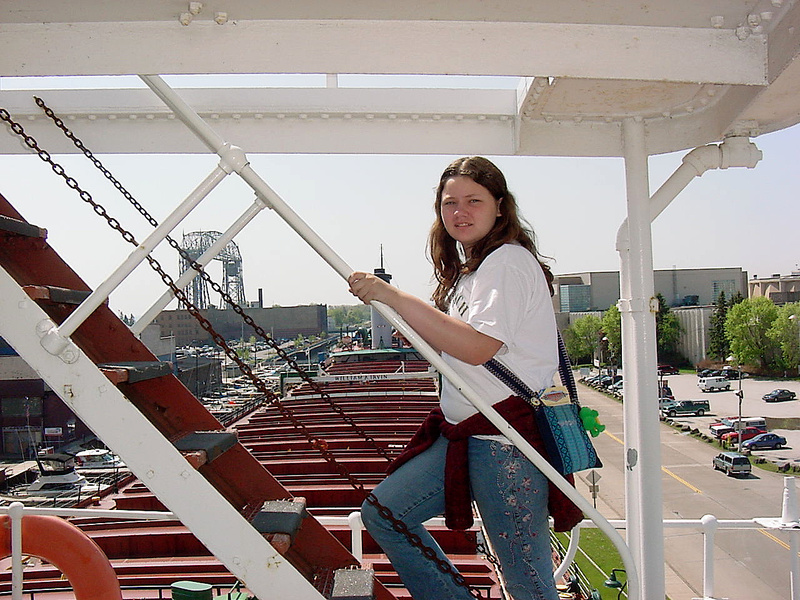 Here Marie climbs to the pilothouse of the William A. Irvin, a retired and preserved ore carrier in Duluth. 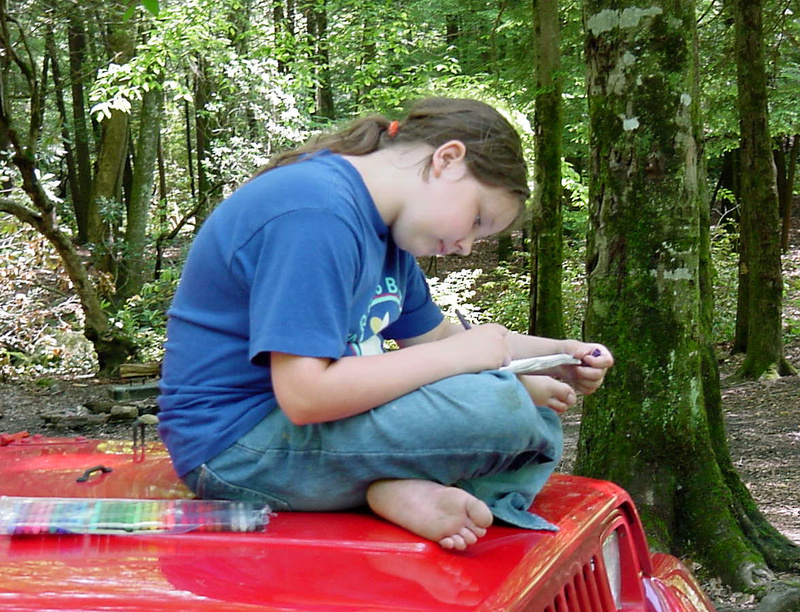 The picture was taken in 2003 with my Sony digital that saved pictures six to a floppy disk. Duluth is a beautiful town, a miniature San Francisco, built on the steep hillside above Lake Superior. Its economy was based on the extractive industries of timbering and ore mining, and these are played out, so the town is contracting and fading away. It still serves as an economic and cultural hub for northeast Minnesota and northwest Wisconsin, but the winters are too brutally cold for retirees. Even the William A. Irvin has gone south for the winter. Mark McKenzie at the tiller of my Alberg 35 Terry Ann. The picture was taken in April of 2017 with my Panasonic DMC-FS7. 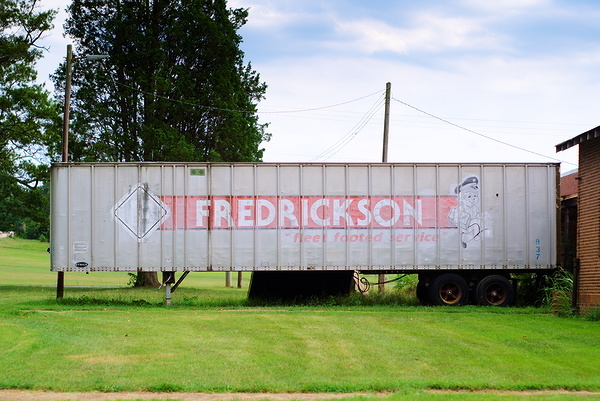 Fredrickson Motor Express was an Atlanta-based regional carrier that sold most of its assets to Old Dominion Freight Lines in 1998 and closed its doors. Their rigs were once common on the roads of the southeast, but the company suffered after deregulation and was on its last legs by the late 1990s. I found this old trailer serving as storage at a small machine shop in Rowan County in July 2018. Old Dominion, headquartered in Thomasville NC, has prospered. The company currrently employs over 17,000 and has annual revenues of around $3 billion. Fujifilm X-T20, Super Takumar 35mm f/3.5 at f/8, 1/105s, ISO 400. Fujifilm X-T20, Super Takumar 35mm f/3.5 at f/8, 1/105s, ISO 800. Fujifilm X-T20, SMC Takumar 55mm f/2 on 12mm extension tube, f/4, 1/105s, ISO 800. I never thought much about using my Super Takumar 150 f/4 on an extension tube, but one day, looking for something different to try, I walked around the neighborhood and got a few shots with the lens on 12mm of extension. Some of them came out nicely. The benefit of using this lens was that with the focal length equivalent of a 225 on a full-frame camera, I could stand back a bit from the subject. This was useful for bees and other insects that, like Dorothy Parker, get nervous when you don't keep your distance. Dorothy allegedly wanted her gravestone to be engraved "If you can read this, you are standing too close". One big difference using the 150 over my shorter lenses was that adjusting the focusing ring on the lens actually made a difference. 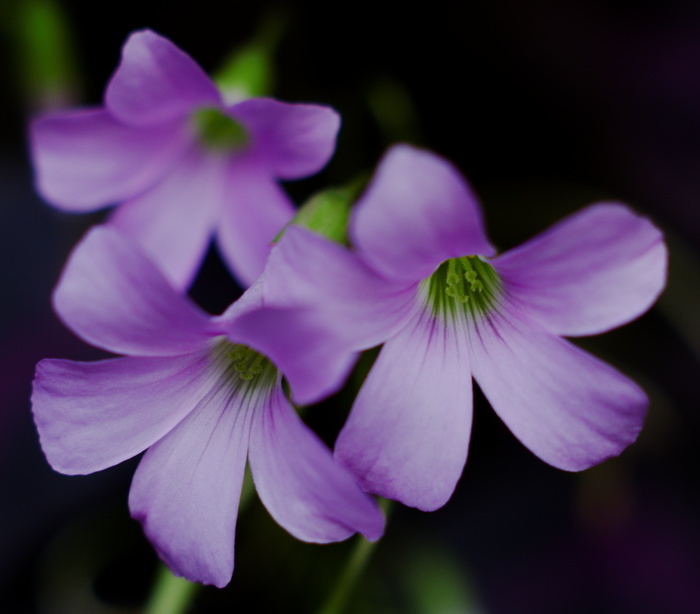 Using my 55mm on an extension tube, focus adjustment is made by physically moving the camera closer or farther from the subject. Whether the focus on the 55 is set for close or infinity makes very little difference. To test the difference between close and infinity, I took photographs of the wallpaper in my living room at the two points. 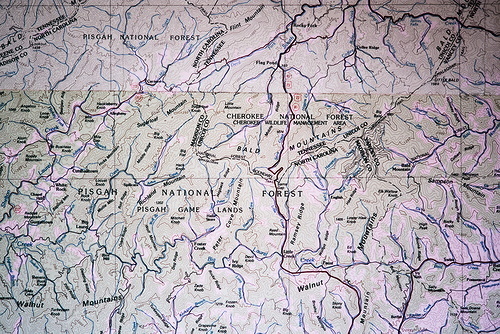 Yes, one wall in my living room is papered with USGS topographic maps. That is the kind of thing you can do if you are single. Don't try this if you are married, your wife would probably hurt you. On a 12mm tube, with the lens racked all the way out to closest focus, the camera was positioned approximately 45 inches from the subject, and the field of view was about 5 inches across. This is not real 1:1 macro, but it is close focusing. It's just outside of 1:5 on my Fujifilm X-T20 APS-C sensor. Set to infinity, the camera was 85 inches from the subject and the field of view was just over 11 inches. On a 12mm tube, the Super Takumar 150 can focus close enough to provide near-macro with cropping, and far enough away to include some nice out-of-focus background behind the subject. It's a decent setup for walking around taking flower and bug shots, and of course it's easy to pull the tube out and have a regular 225mm equivalent telephoto. Now that I know what it will do, I will probably use it more. A final note - this test was designed to determine the field of view at different focusing points, not to provide any kind of information about image quality. I used my Fujifilm X-T20 body and its excellent focus-peaking feature to obtain focus, but I didn't obsess about it and bracket shots. The camera was mounted on a tripod and the shutter was tripped with a wired release. Post-processing was in RawTherapee and was minimal. I used my version of the pre-installed auto-low ISO, which adds Fuji Velvia film emulation at 50% strength, with auto levels for exposure. I used the standard post-resize sharpening. I can see some vignetting in the top corners at infinity focus. It could be corrected in post-processing. Fujifilm X-T20, Super Takumar 150mm f/4 on 12mm extension tube, f/5.6, 1/1100s, ISO 1250. Handheld at 1/8th of a second. Not to brag or anything. Fujifilm X-T20, SMC Takumar 35 f/3.5, f/8, 1/8s, ISO 1250. I went to see my friend Mark, to pick up some Lexan scraps he had snagged for me out of the scrap bin at his plant, and to drink a beer. 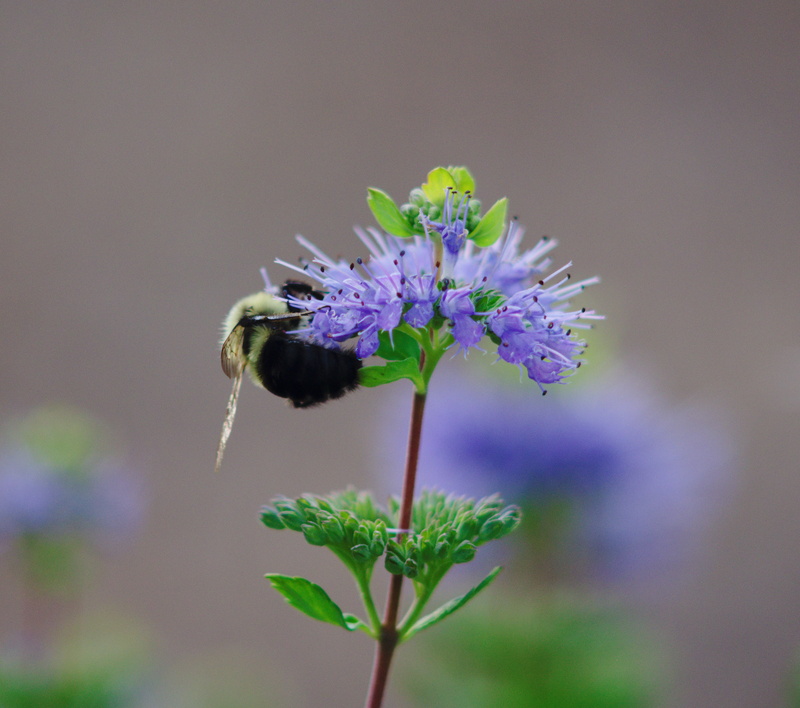 He needed a few minutes to finish tilling up his yard so while I waited I took some pictures of his wife Gretchen's flower beds. Fujifilm X-T20, SMC Takumar 55 f/2 on a 12mm extension tube, f/5.6, 1/320s, ISO 400. A set of 90 photographs from a trip that Marie and I made to the west coast and back in 2001. Depending on your monitor, you may be able to click on them and see them a bit bigger. The original pictures were taken at 1280 by 960 pixels on a Sony disc camera. 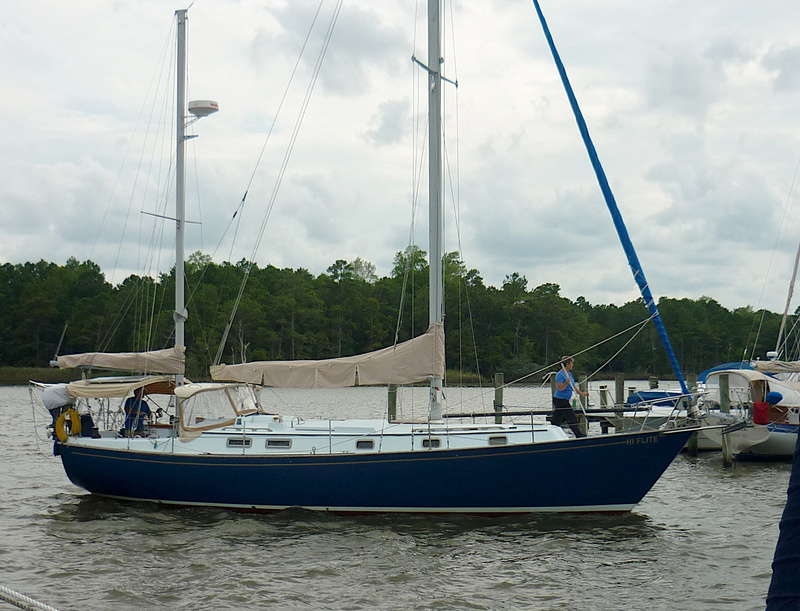 This is my fine-lined Alberg 35 Terry Ann on the dock in Edenton in June 2018. Fujifilm X-T20, XC16-50 f/3.5-5.6 at 22mm, f/8, 1/400s, ISO 200. Lou's house and yard in St. Pete. He has a double lot with plenty of room. Roy and Jeannie used to take down part of the fence and back their enormous RV in there for extended visits, before they bought their own place around the corner. St. Petersburg is hard to resist. I took the picture on a visit in March 2018. Fujifilm X-T20, XC16-50 f/3.5-5.6 at 16mm, f/9, 1/250s, ISO 400. I turned up this old one of Levi and Lars from December 2014 and decided it was worth posting here. Fujifilm X-T20, SMC Takumar 55 f/2, f/5.6, 1/150s, ISO 200. Back in July I posted a shot of this train entering the Bluefield yard the afternoon of July 13th, 2018. 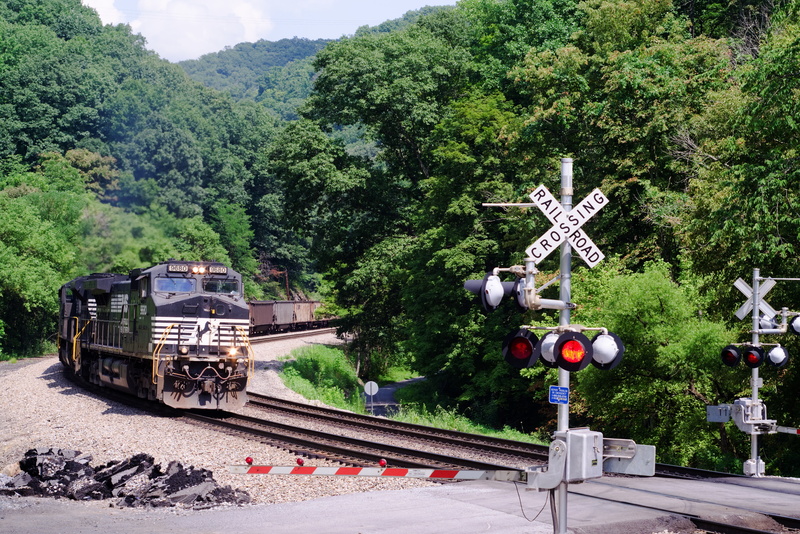 Here we see it a few minutes earlier at a grade crossing just east of Ada WV. Lush green foliage covers the low mountains and a pile of jack-hammered asphalt awaits disposal, remnants of the freshly-paved crossing. Fujifilm X-T20, probably SMC Takumar 55 f/2, stopped down, 1/400s, ISO 400. As a reminder that this sweltering summer will not last forever, I dug up this old shot from February 2015 of my Jeep in a North Carolina snowstorm. Panasonic Lumix DMC-FS7,1/200s, ISO 80. Fujifilm X-T20, SMC Takumar 55mm f/2 at f/4, 1/50s, ISO 200, short extension tube, on a tripod. 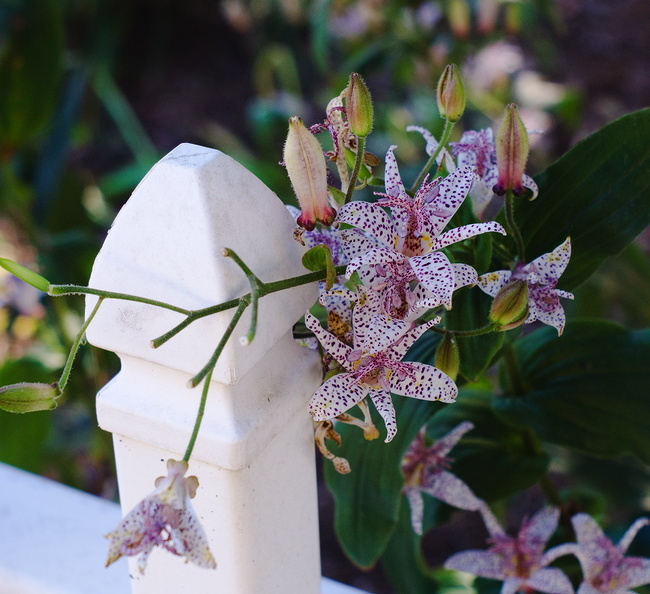 Ardmore people love keeping their yards neat and growing flowers. 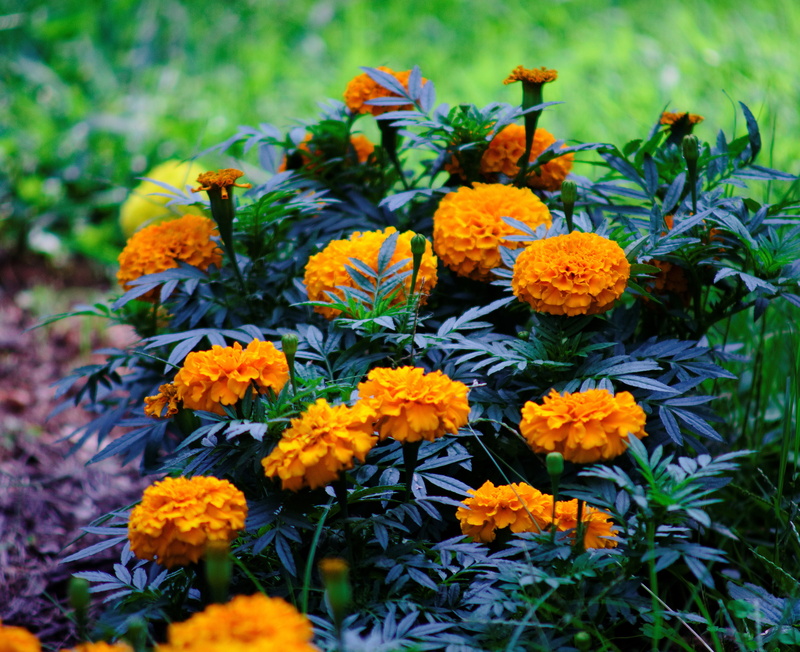 Here are chrysanthemums looking good in late summer when most of the other flowers have wilted and gone to seed. 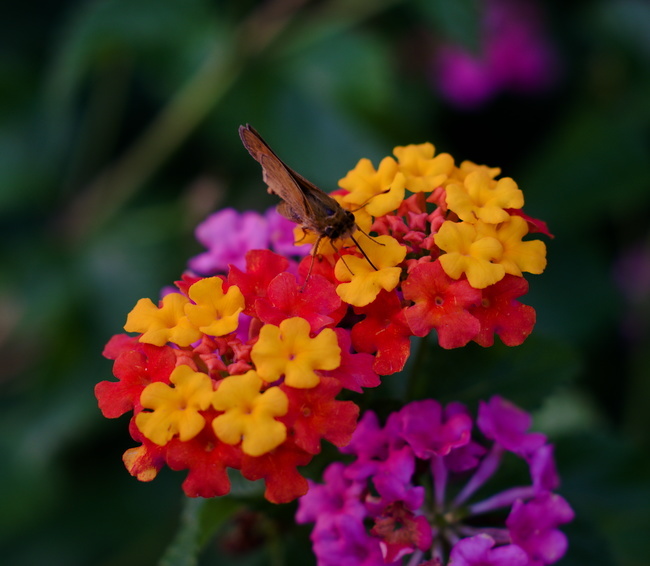 The picture was taken with a Canon 70-210 macro zoom mounted on my X-T20. The lens is a real beast, large and heavy, but versatile. The image quality is decent for this old glass that even in its day was good but not the best. Post-processing in RawTherapee helps make up for some of its deficiencies. This shot got a healthy dose of Fuji Velvia film emulation and moderate unsharp mask. Fujifilm X-T20, Canon FD 70-210 f/4, 1/750s, ISO 800. All photographs by Paul M. Clayton unless otherwise noted.